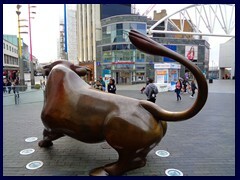 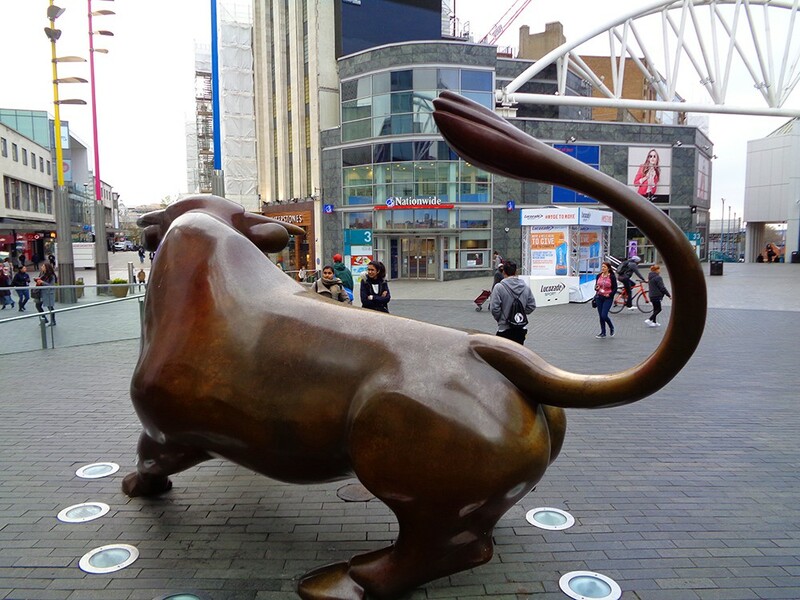 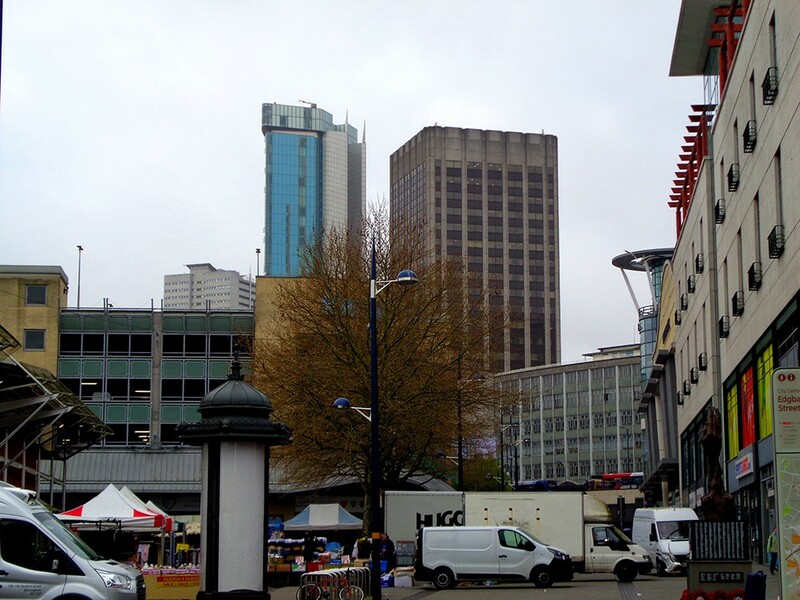 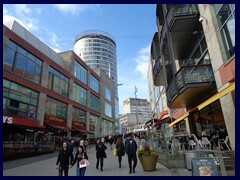 Bull Ring is a major commercial area in the south edge of Birmingham's city centre. 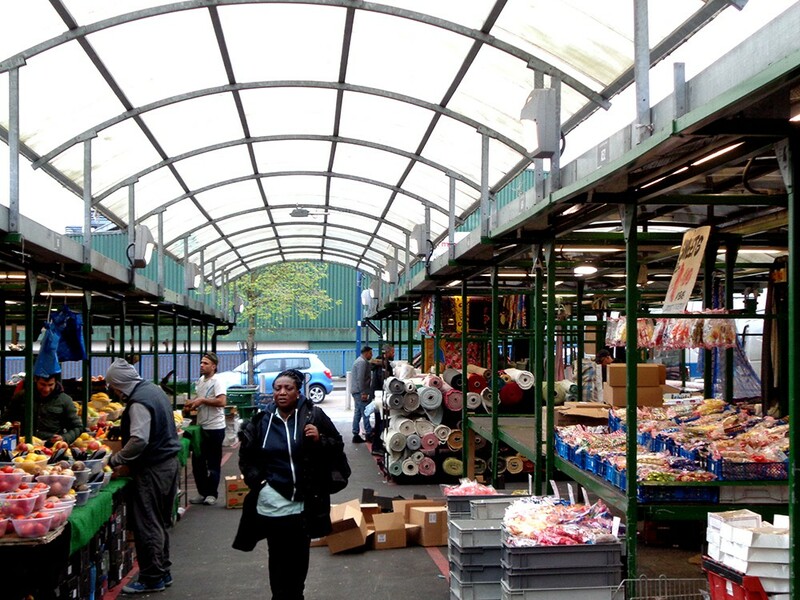 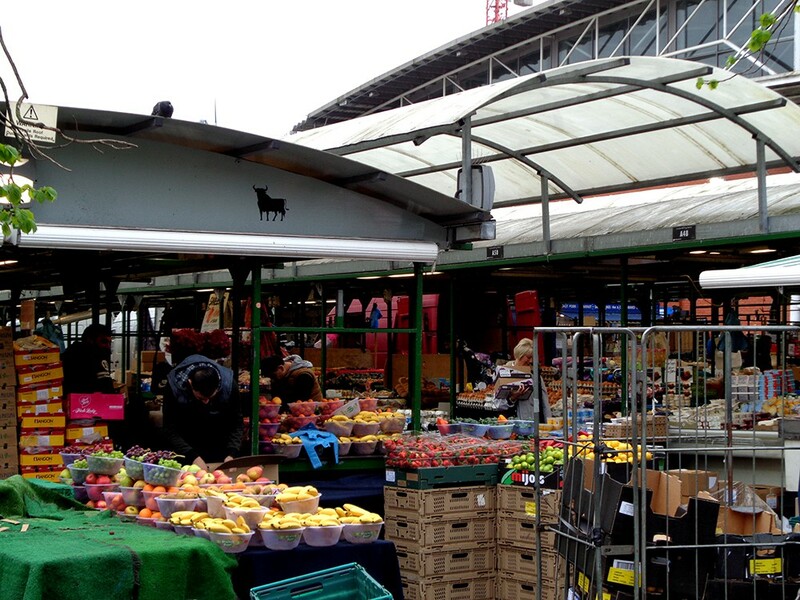 It has been a market since the middle ages. 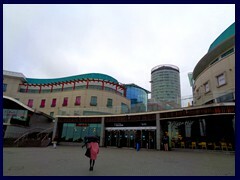 Today it is filled with postmodern and futuristic buildings. 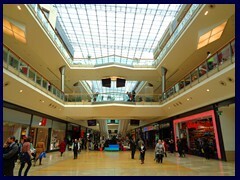 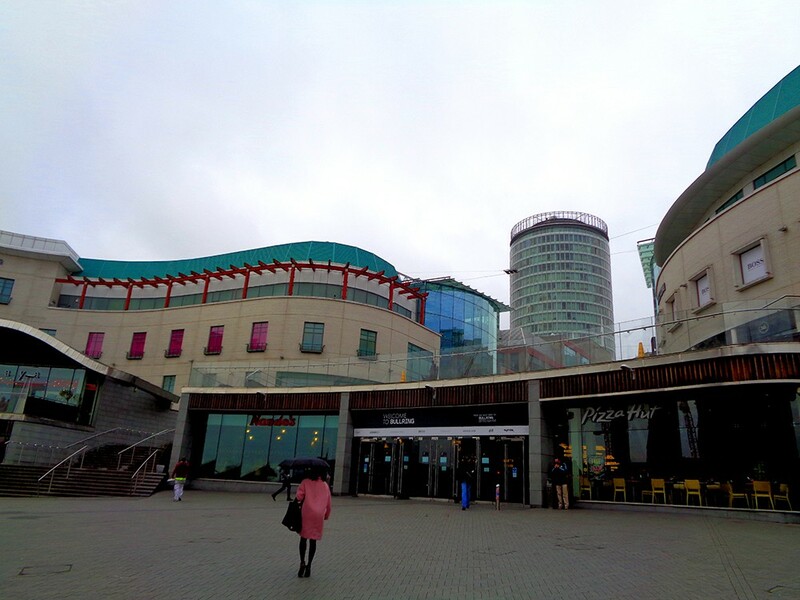 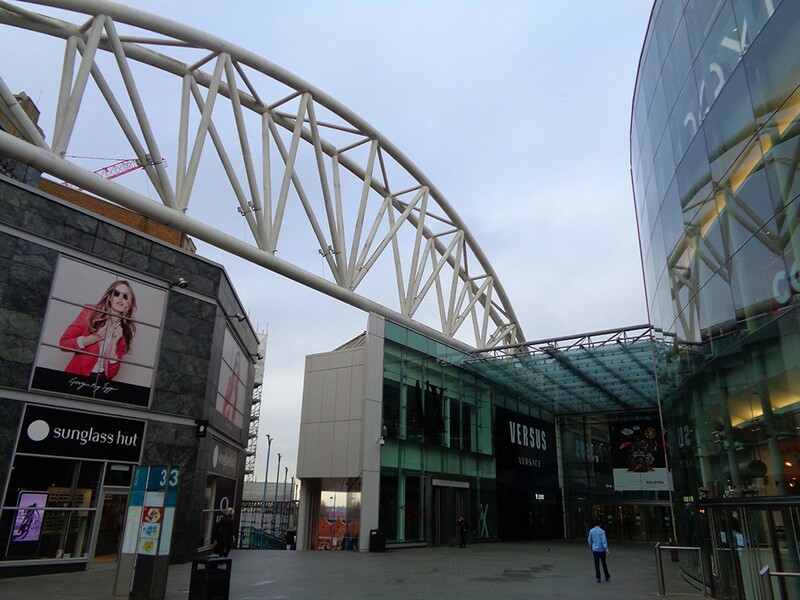 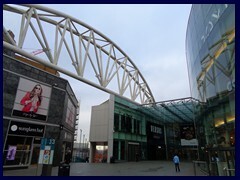 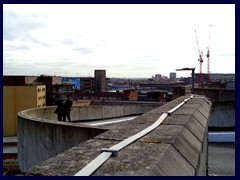 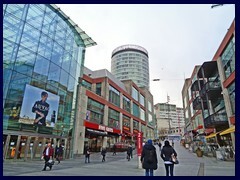 There are two large shopping malls, built in 1960 and 2003, Bullring and Bull Ring, connected underground. 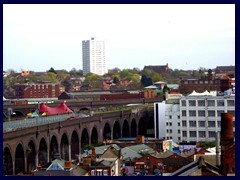 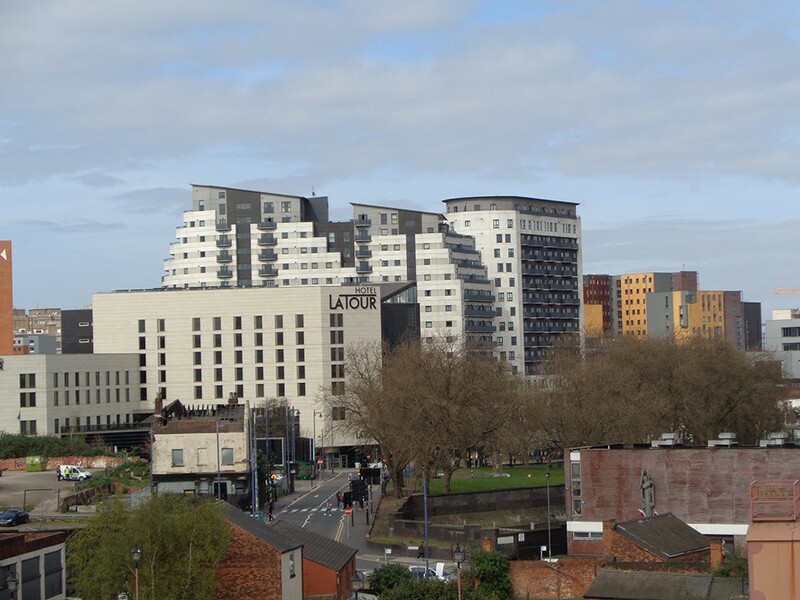 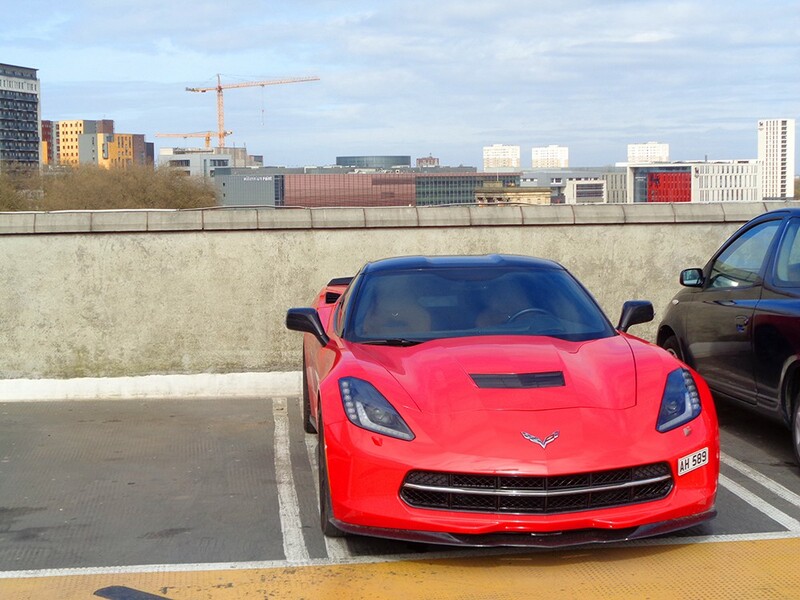 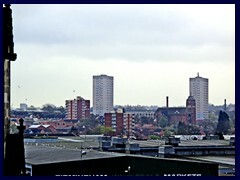 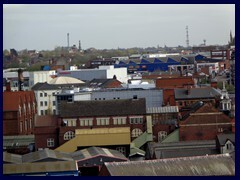 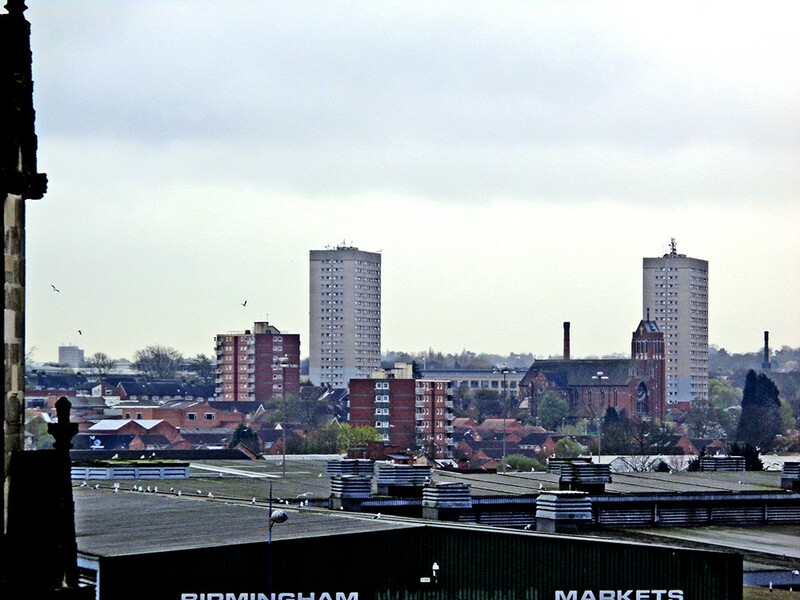 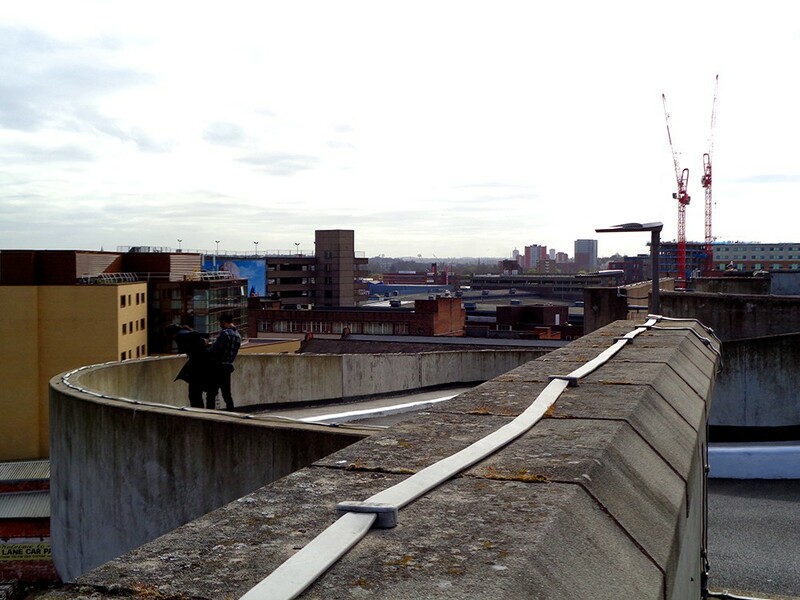 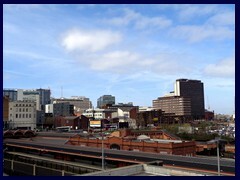 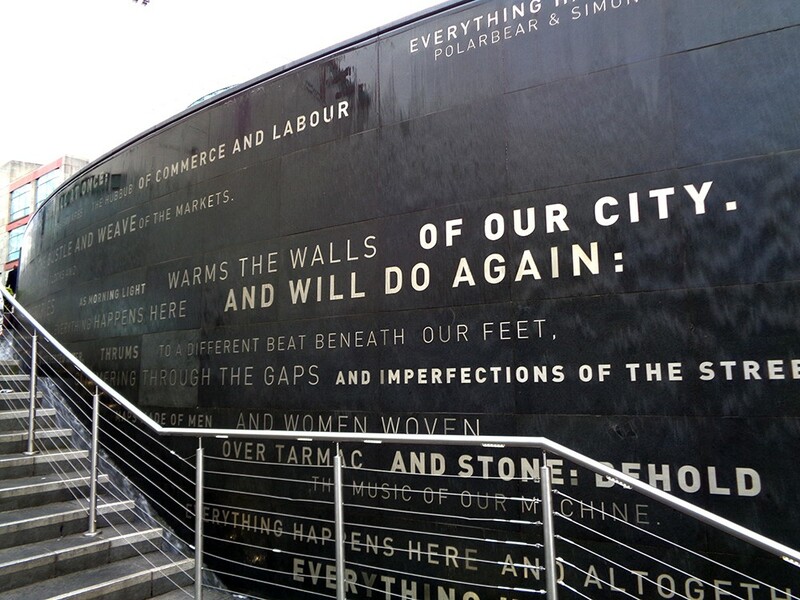 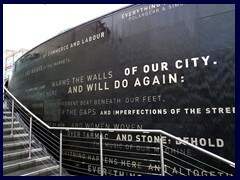 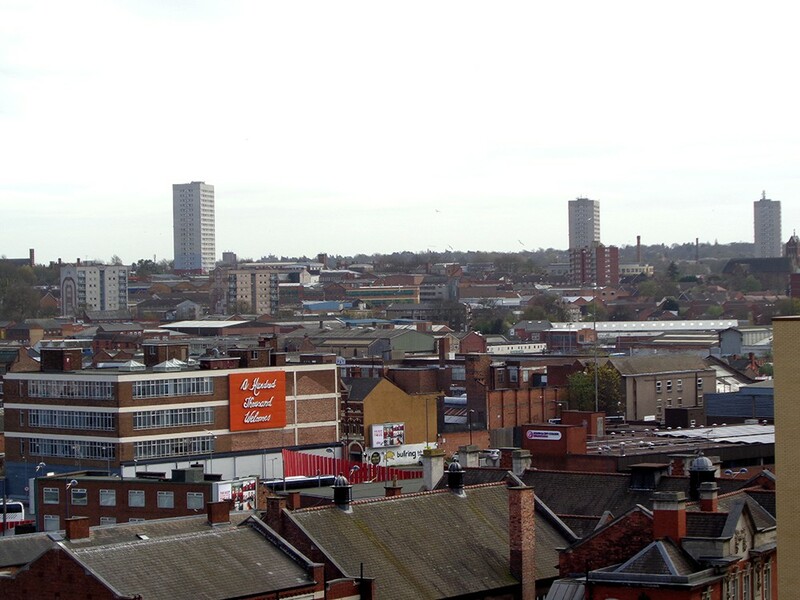 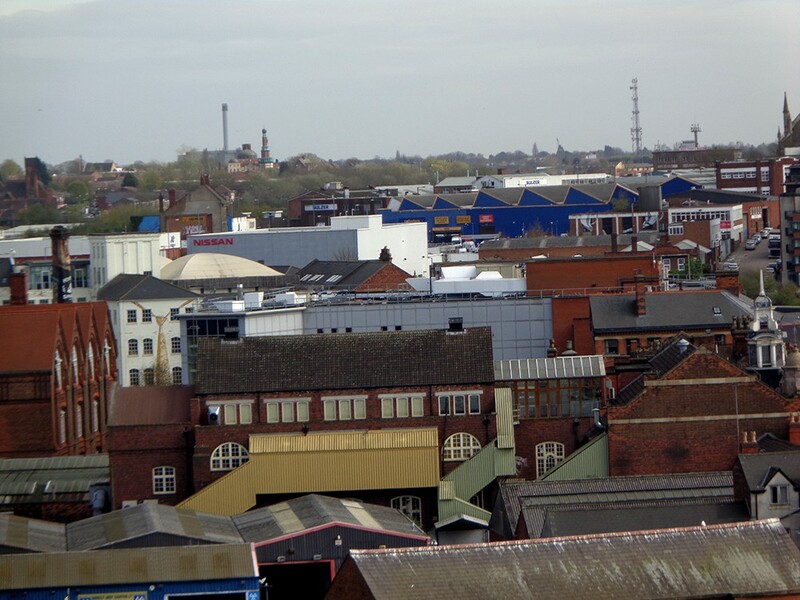 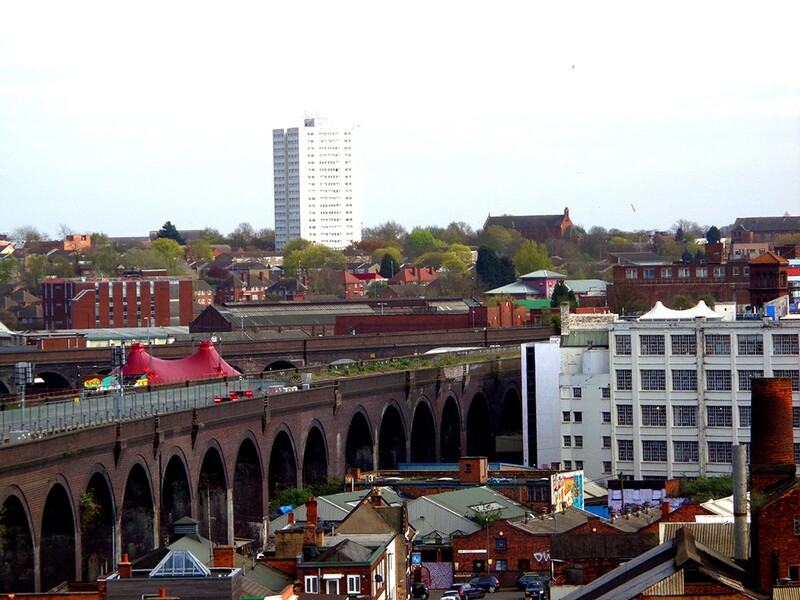 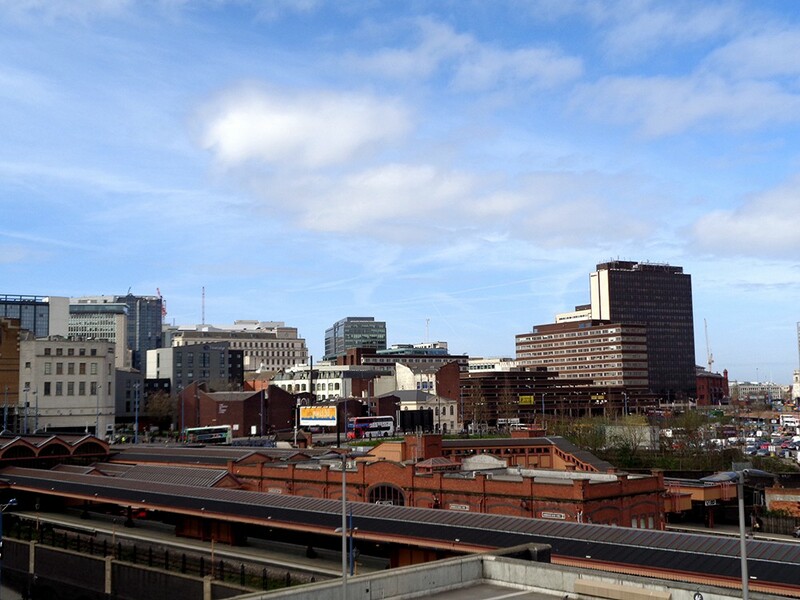 It is situated on a steep sandstone ridge, bordering Digbeth. 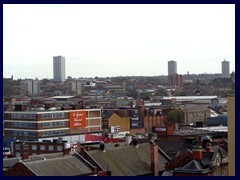 There are nice terraces with views of the city at the upper part. 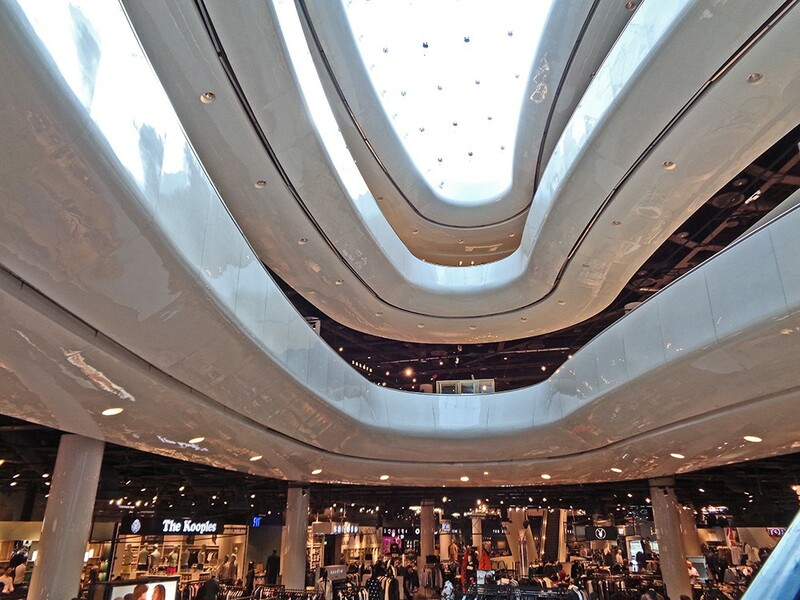 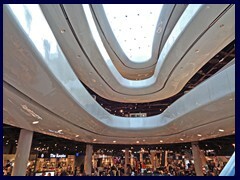 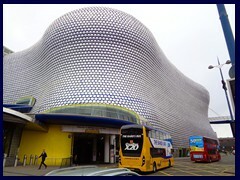 The Selfridges department store (one of only four in the UK), connected to the mall, is famous for its sweeping futuristic design by Future Systems, resembling a jellyfish. 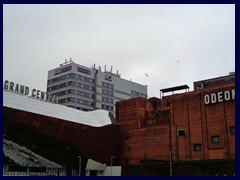 It opened in 2003. 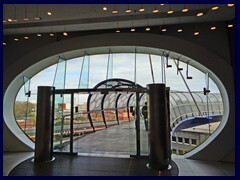 Inside there is a futuristic atrium with sweeping escalators and a futuristic curved escalator that leads to a multi storey parking garage. 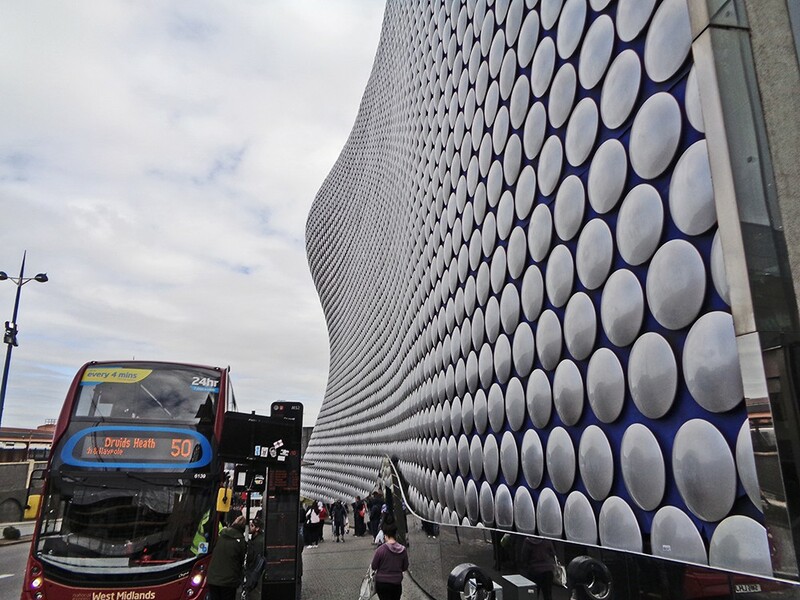 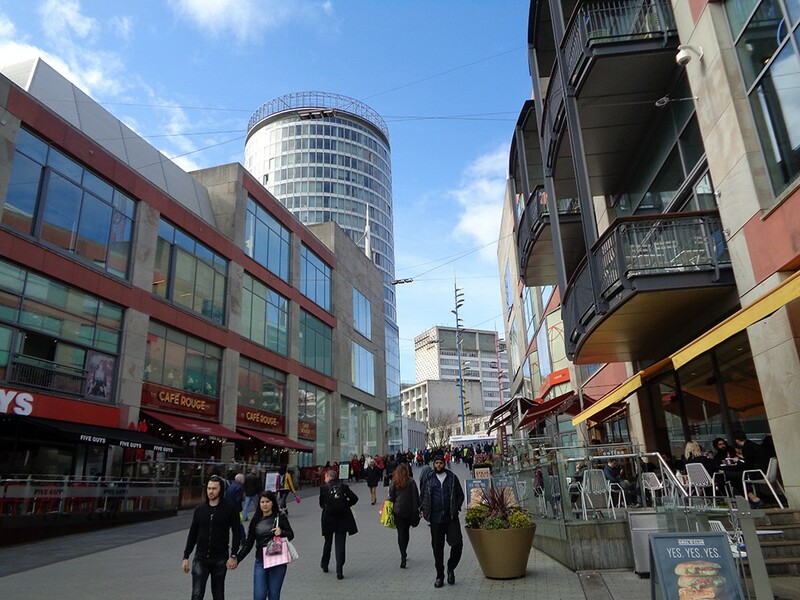 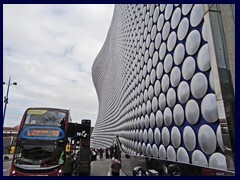 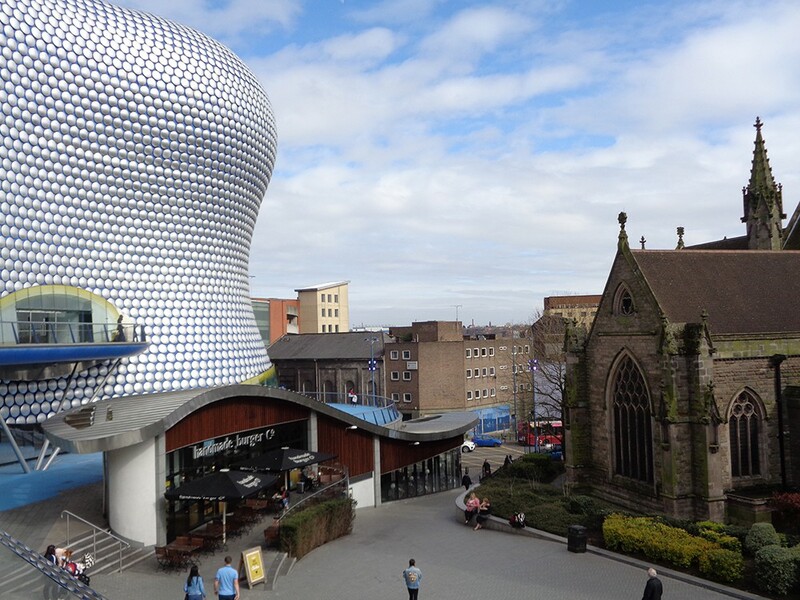 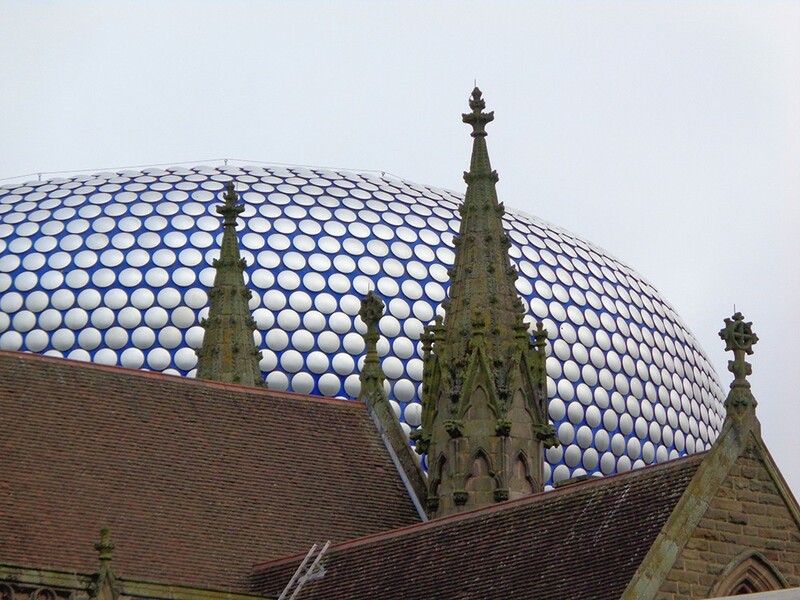 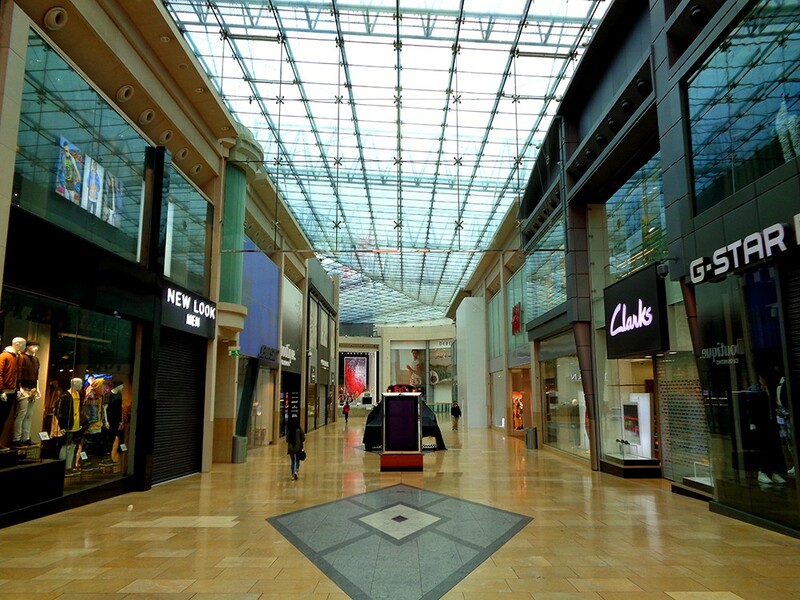 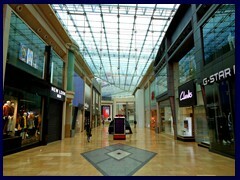 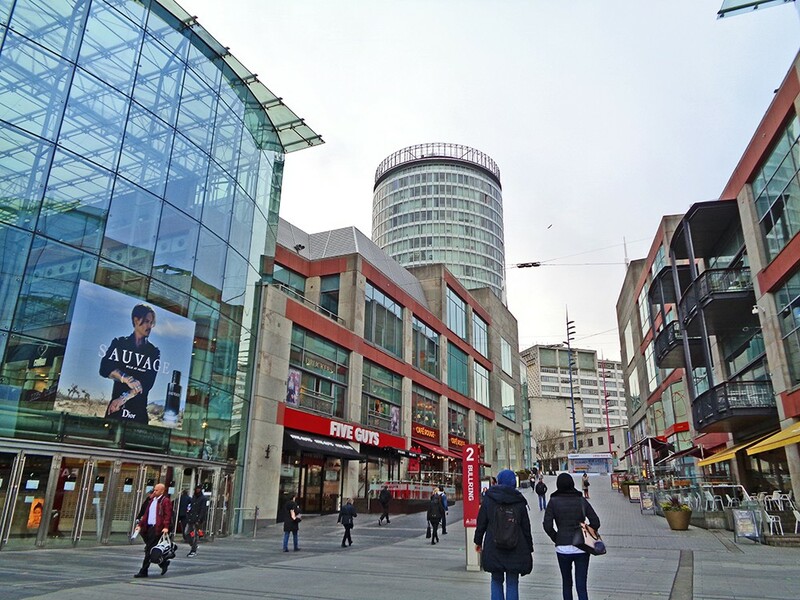 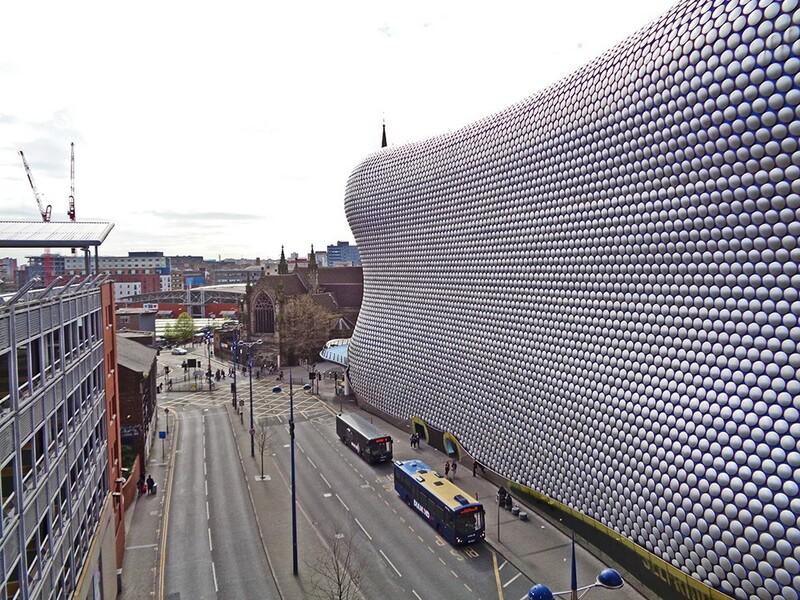 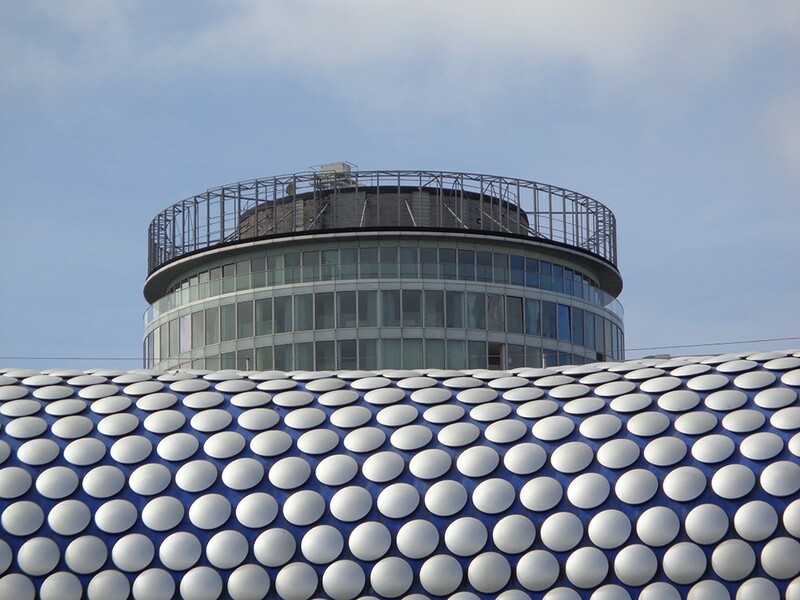 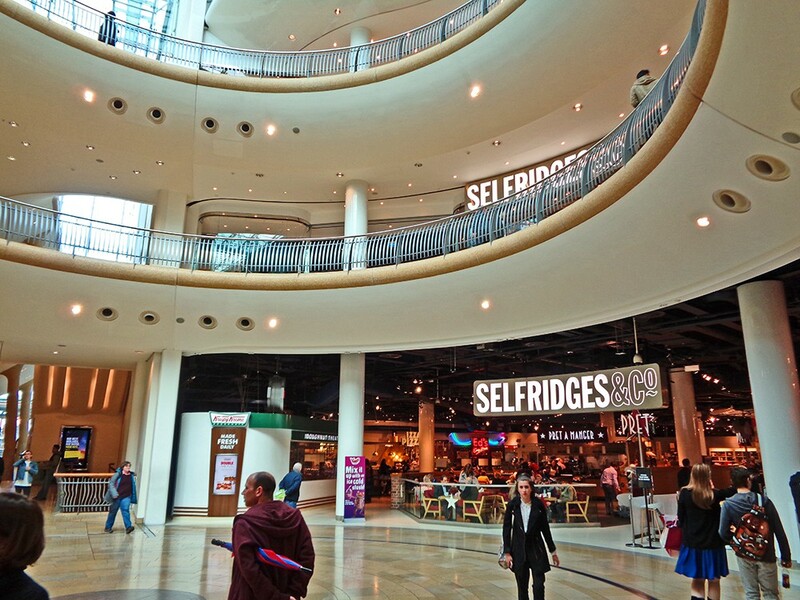 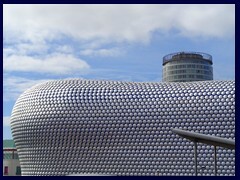 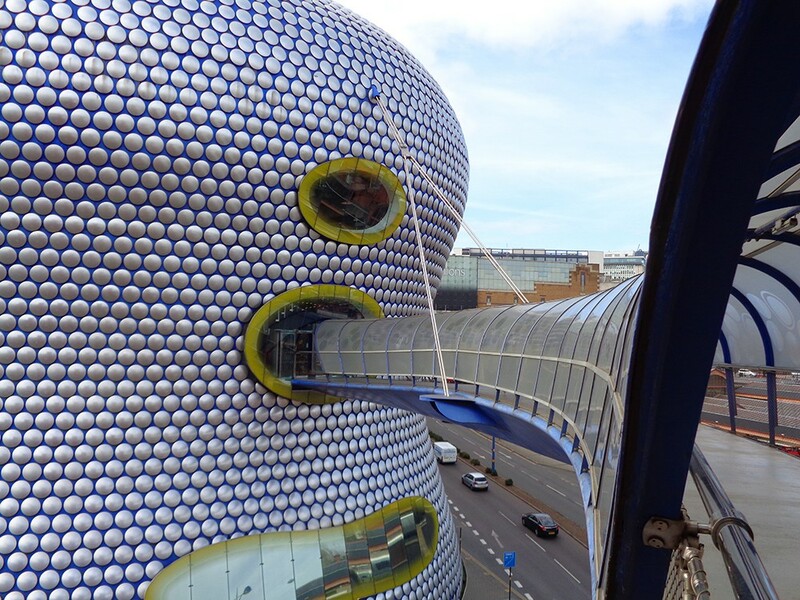 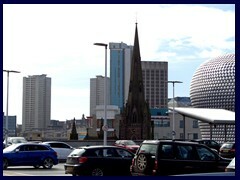 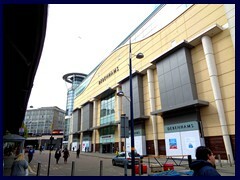 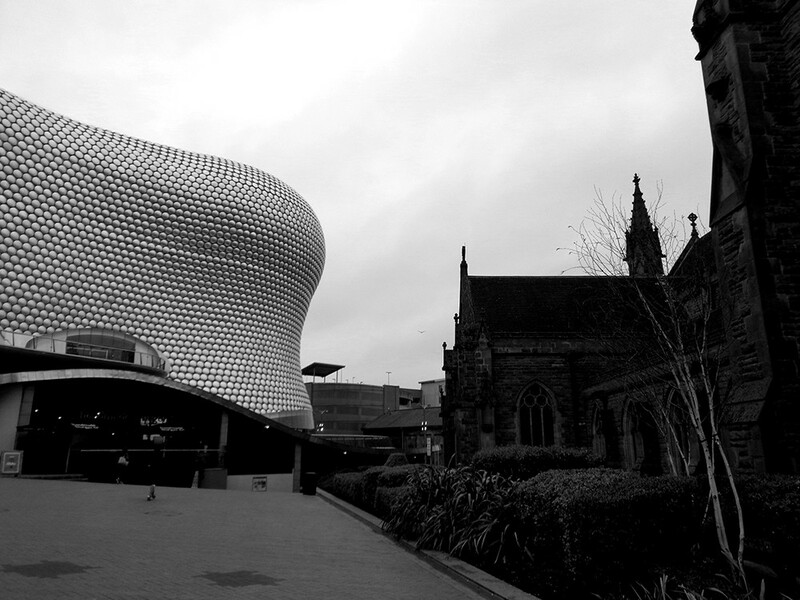 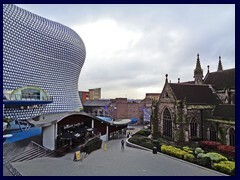 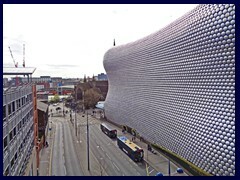 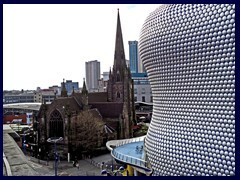 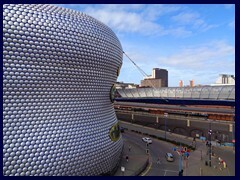 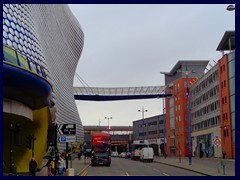 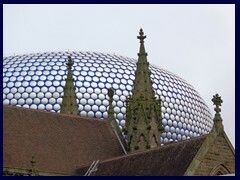 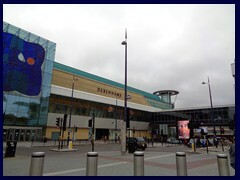 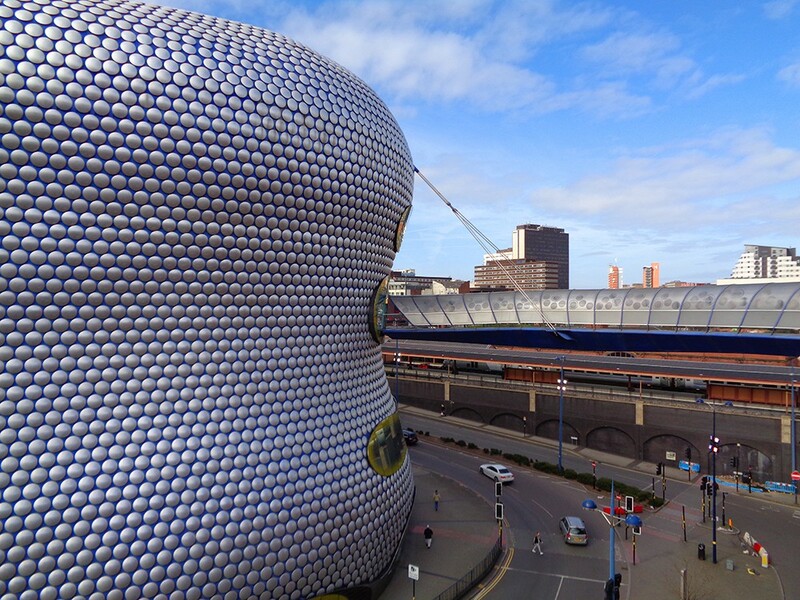 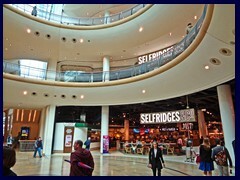 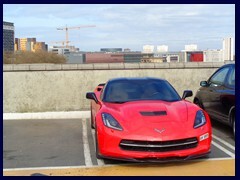 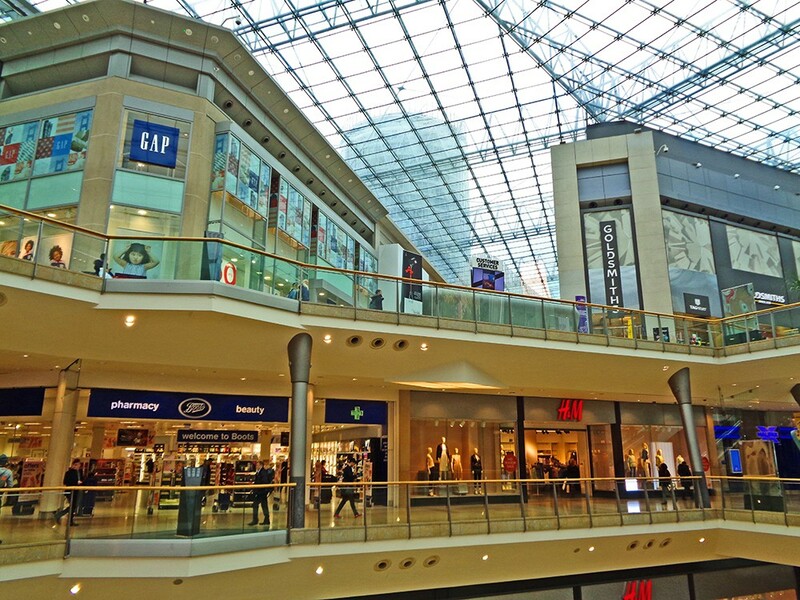 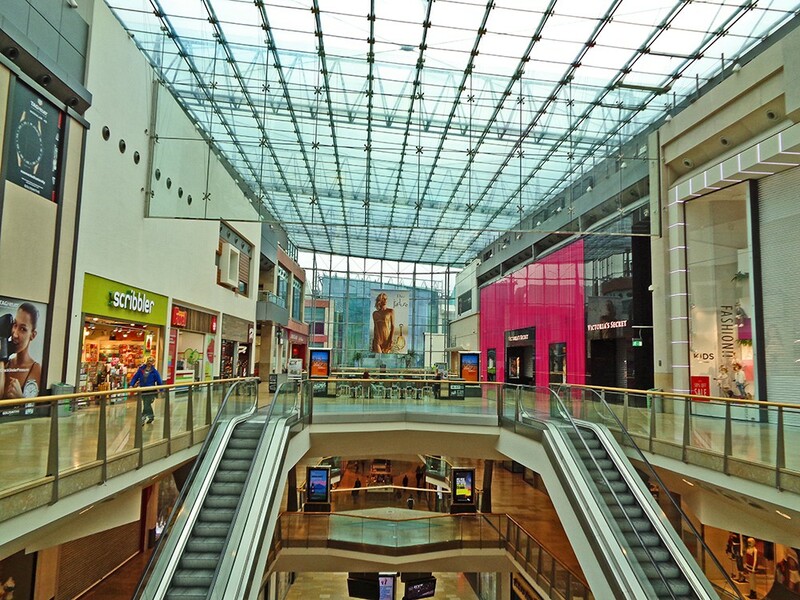 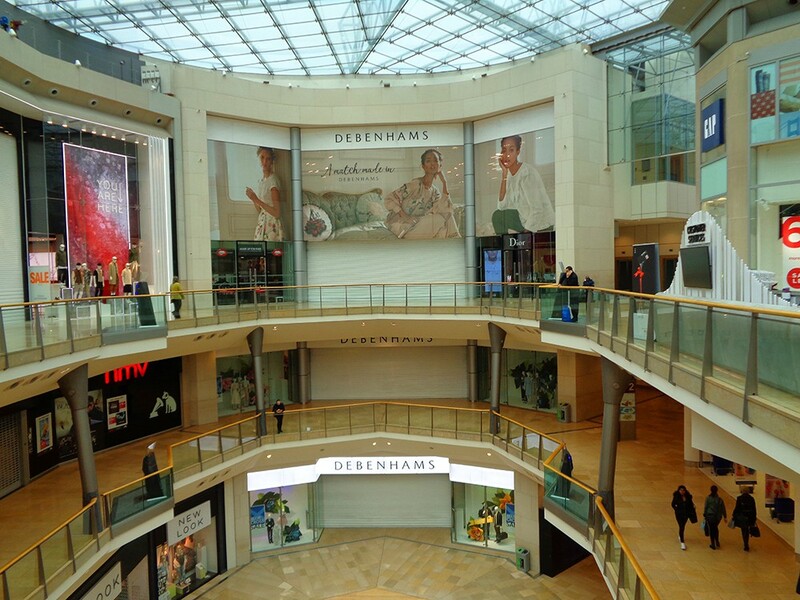 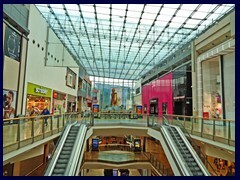 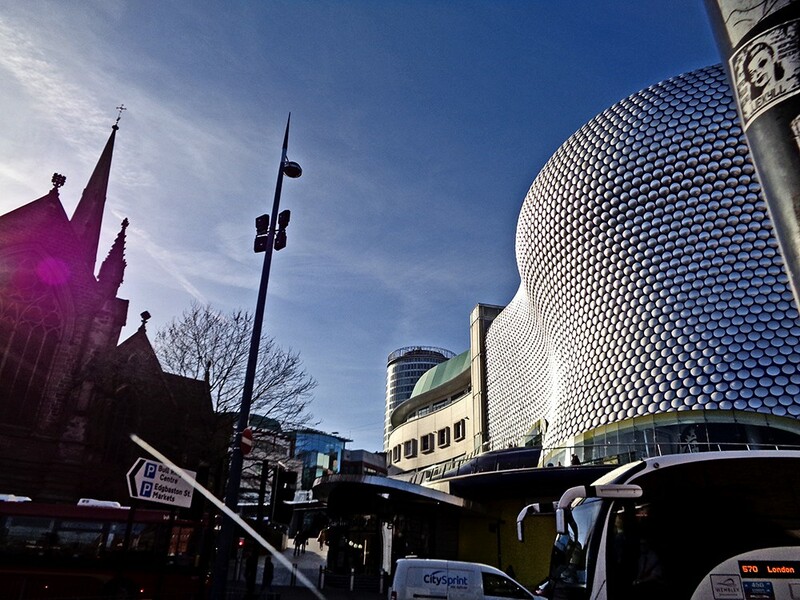 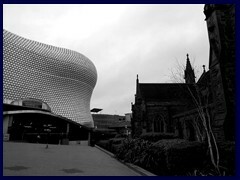 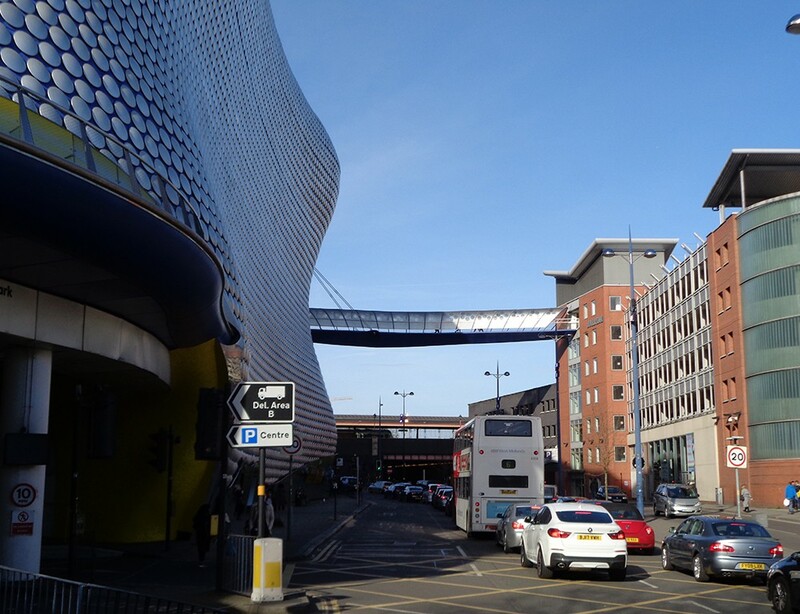 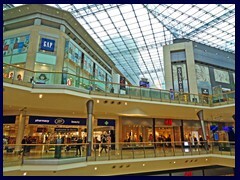 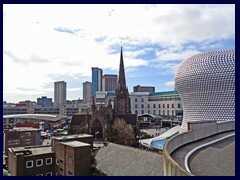 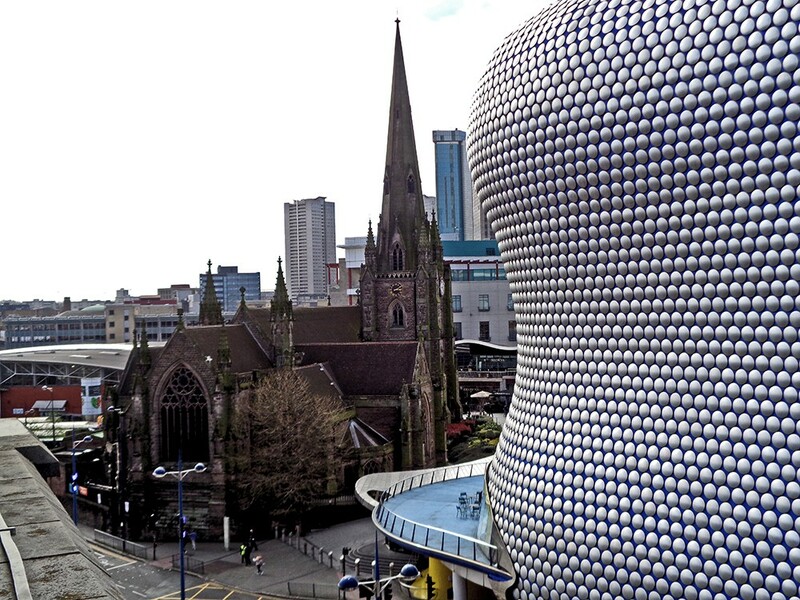 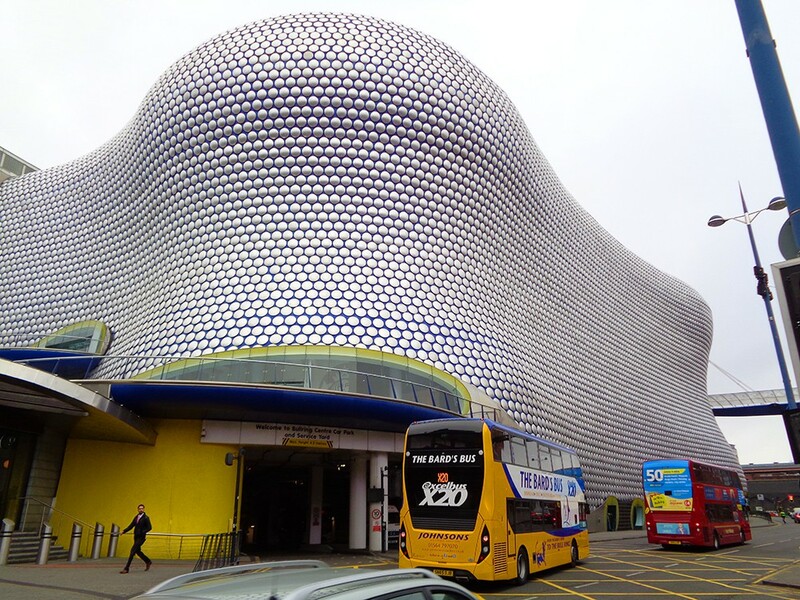 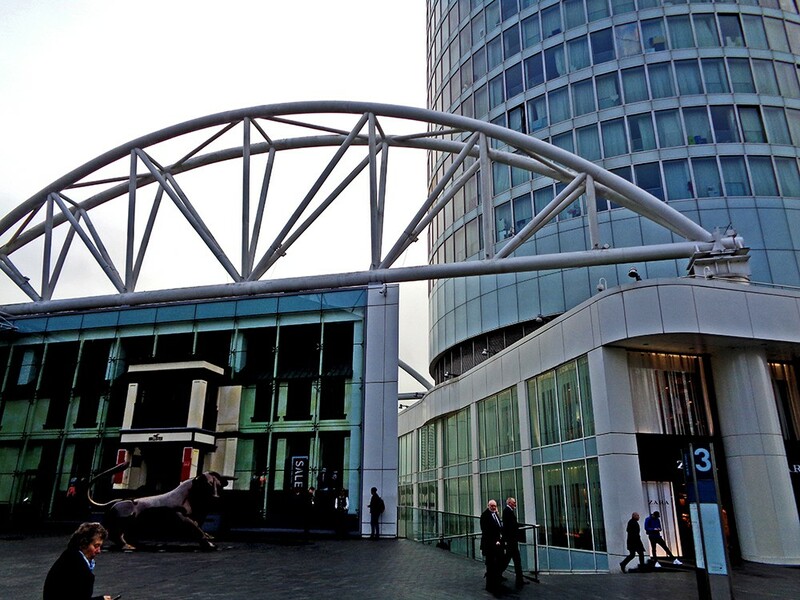 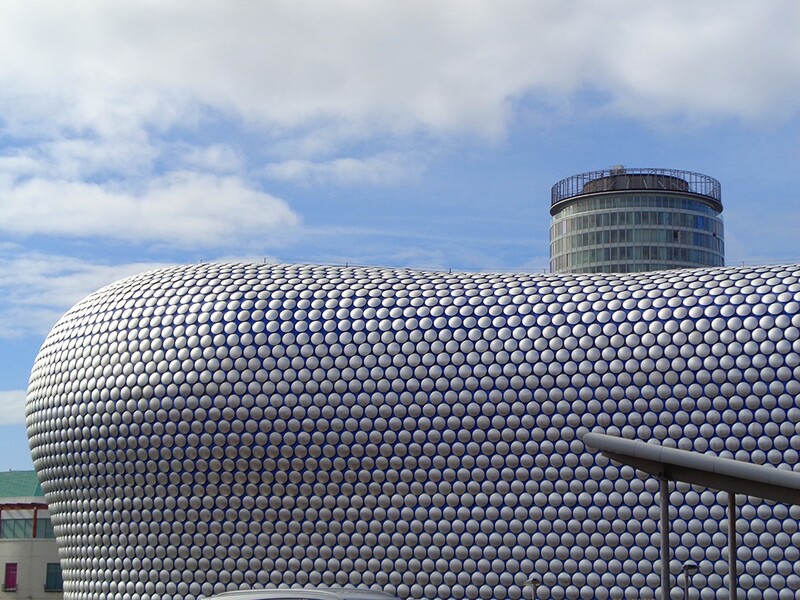 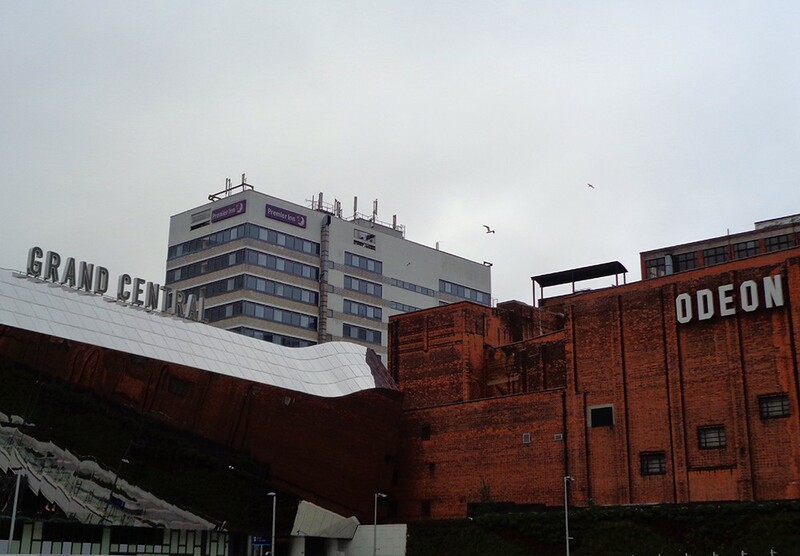 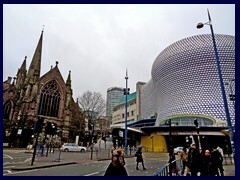 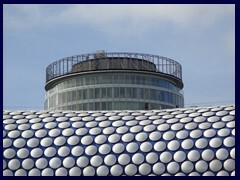 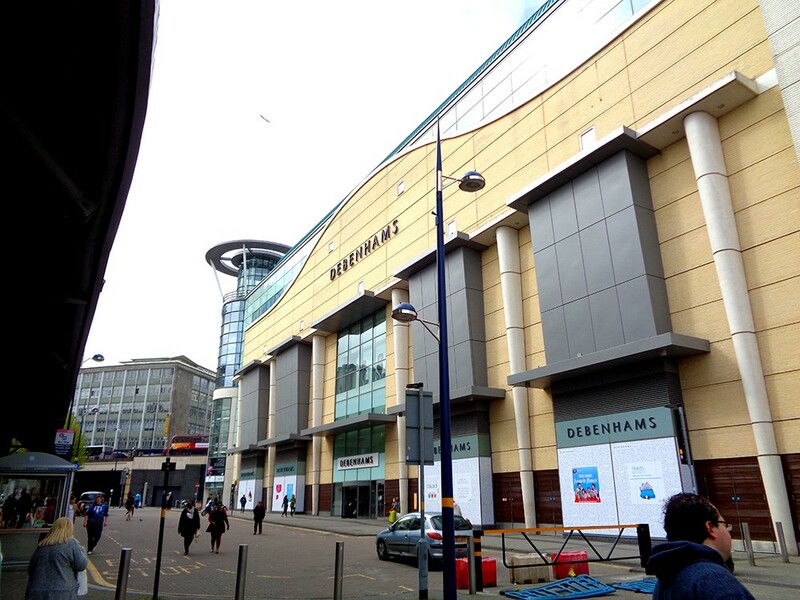 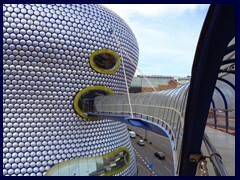 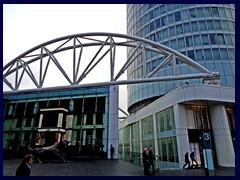 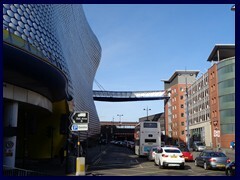 The UK:s 4th largest branch of the department store chain Debenhams can also be found at the Bull Ring complex. 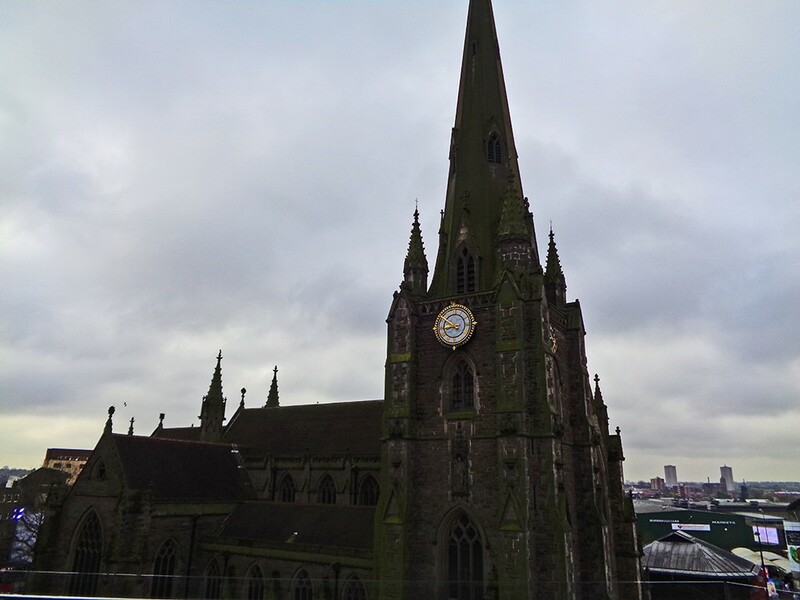 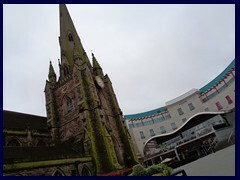 St Martins in the Bullring is a historic church, a great contrast to the otherwise very modern buildings. 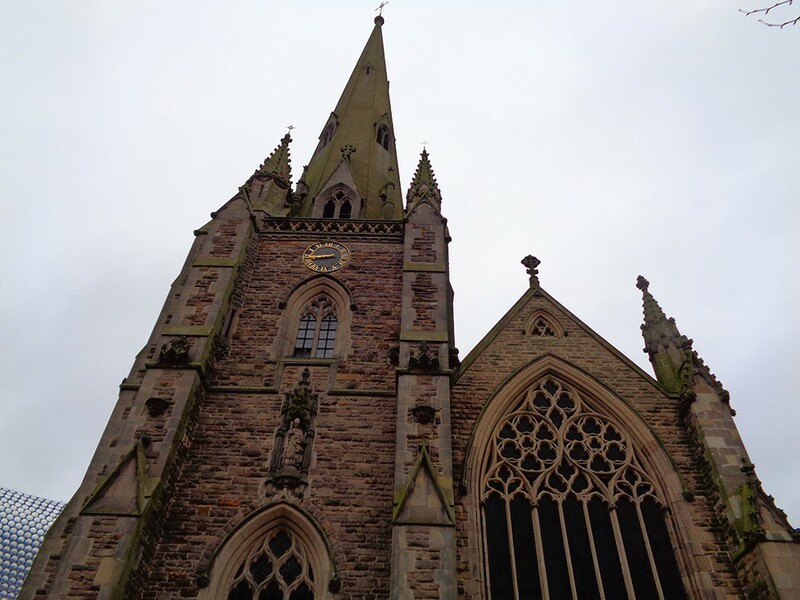 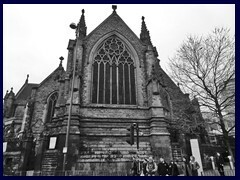 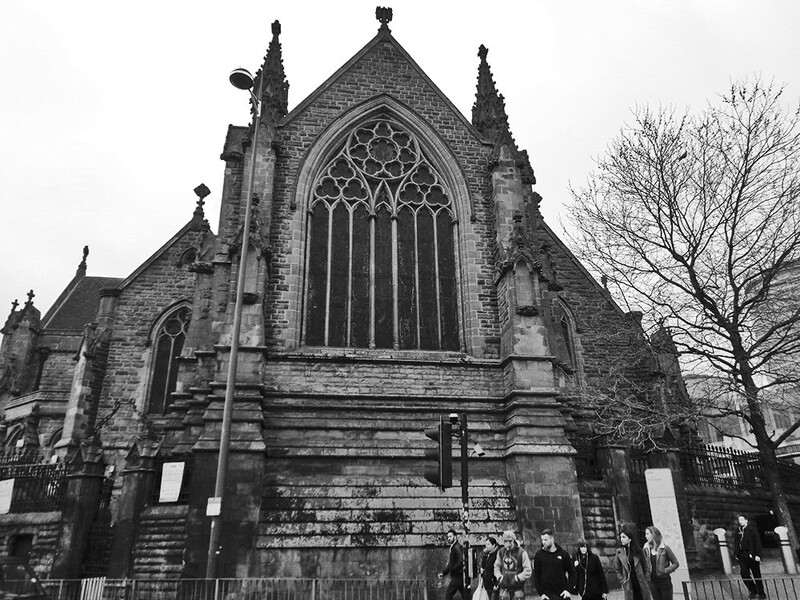 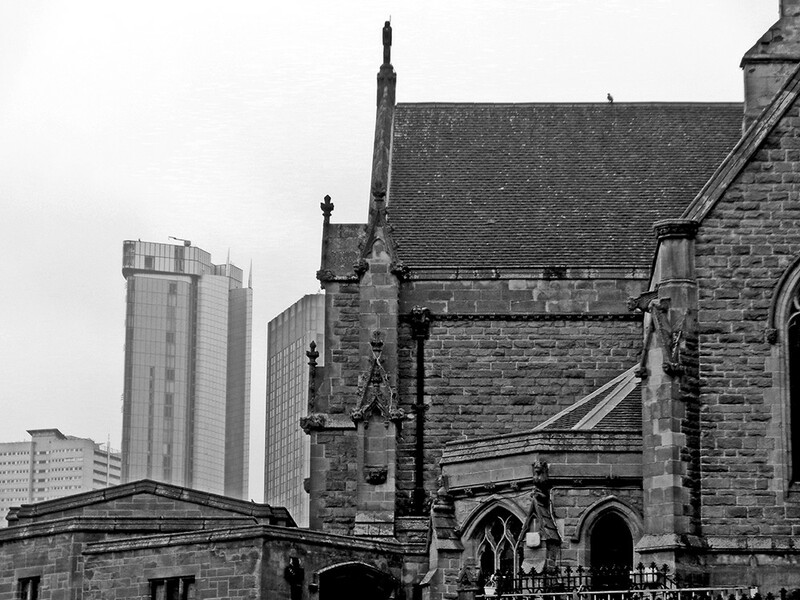 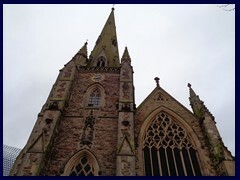 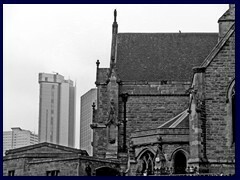 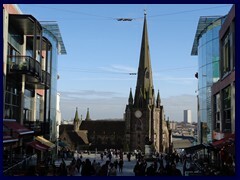 It is the original parish church of Birmingham, rebuilt in the 1870s in neo-gothic style, replacing the 1263 church that was rebuilt many times. 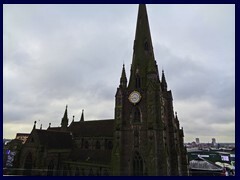 The height of the spire is 61m. 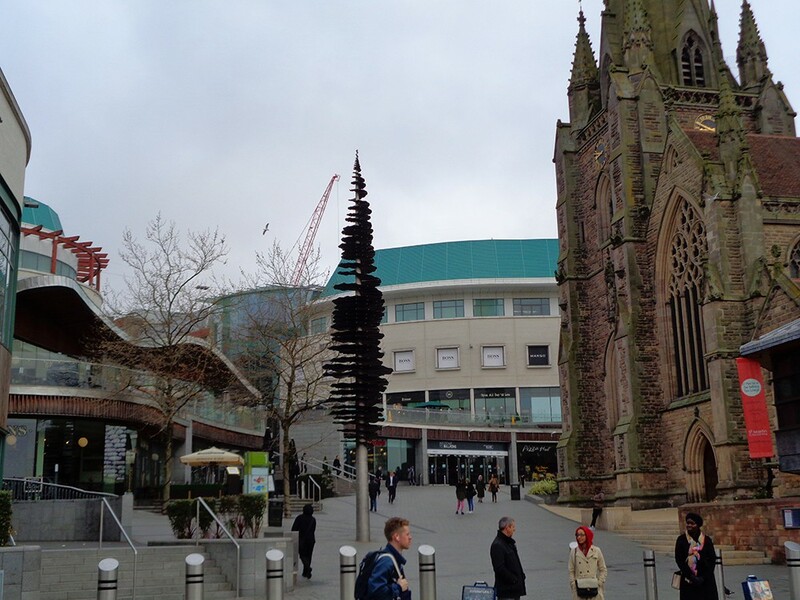 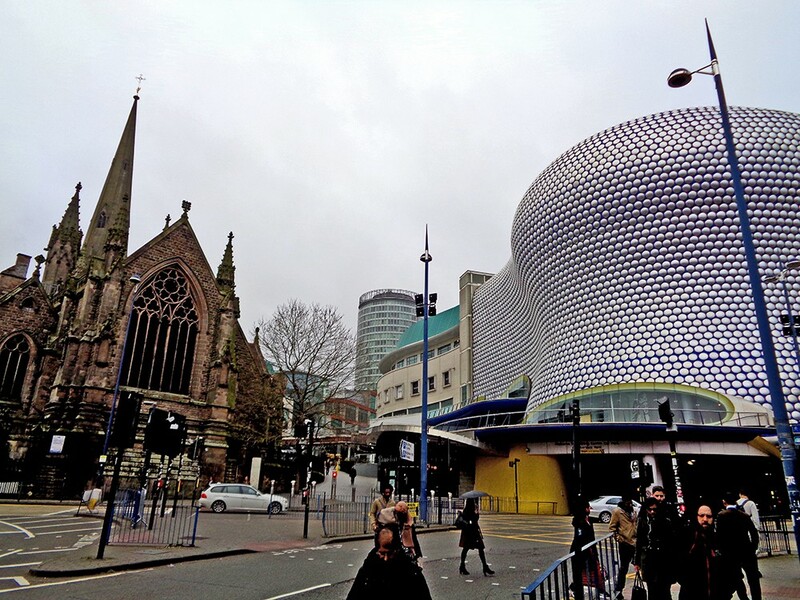 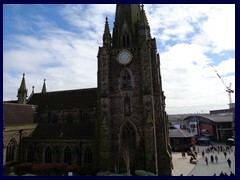 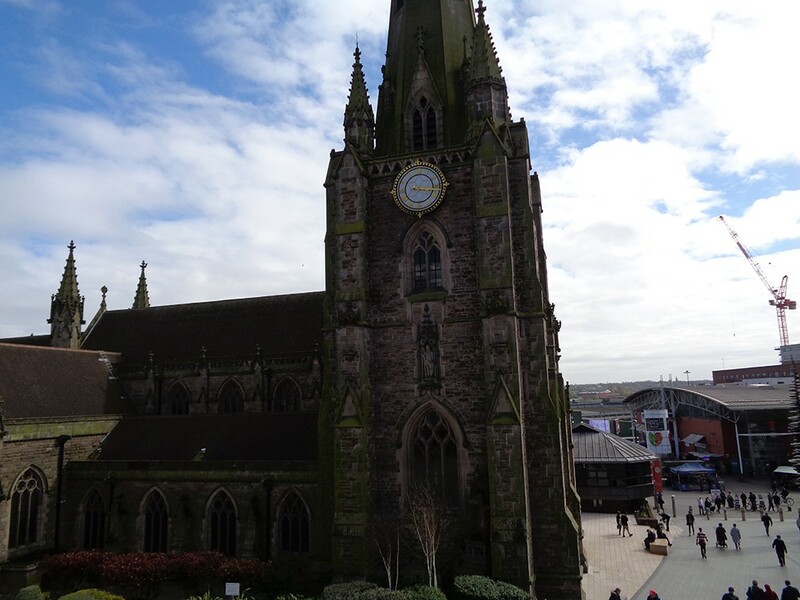 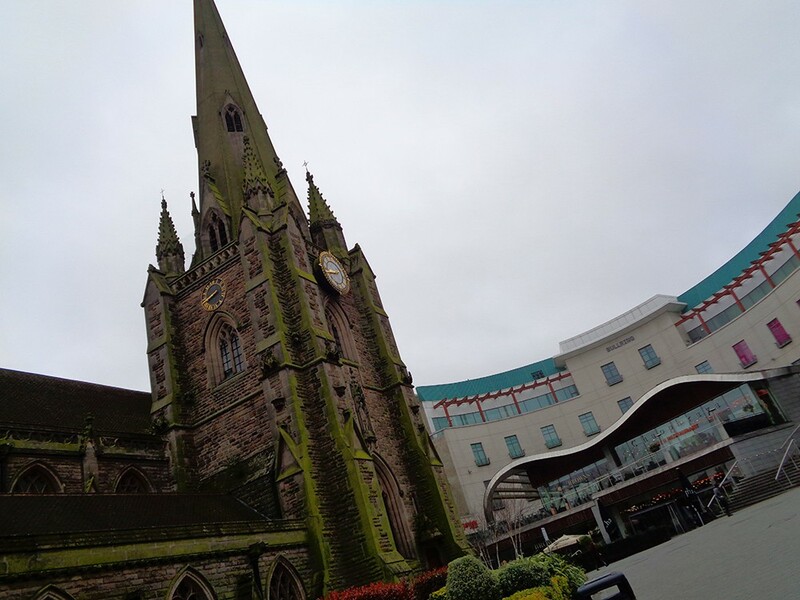 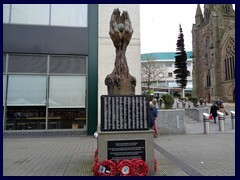 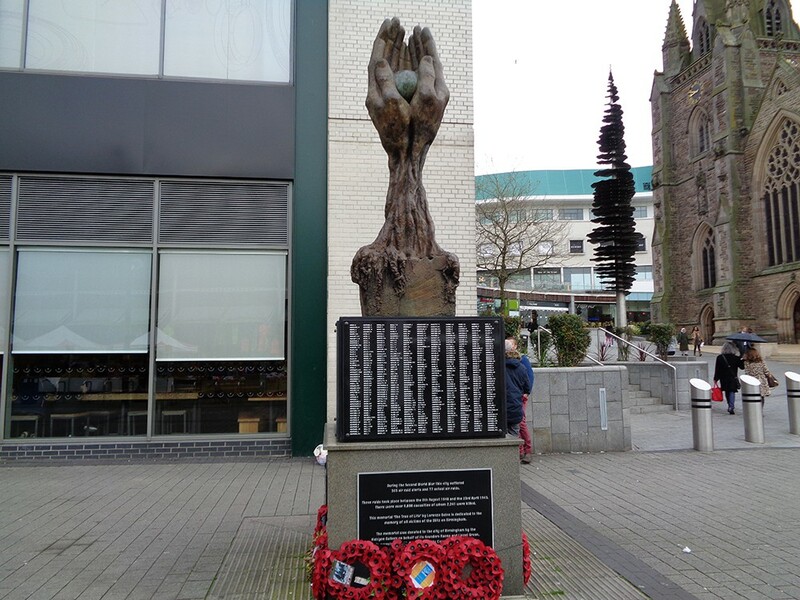 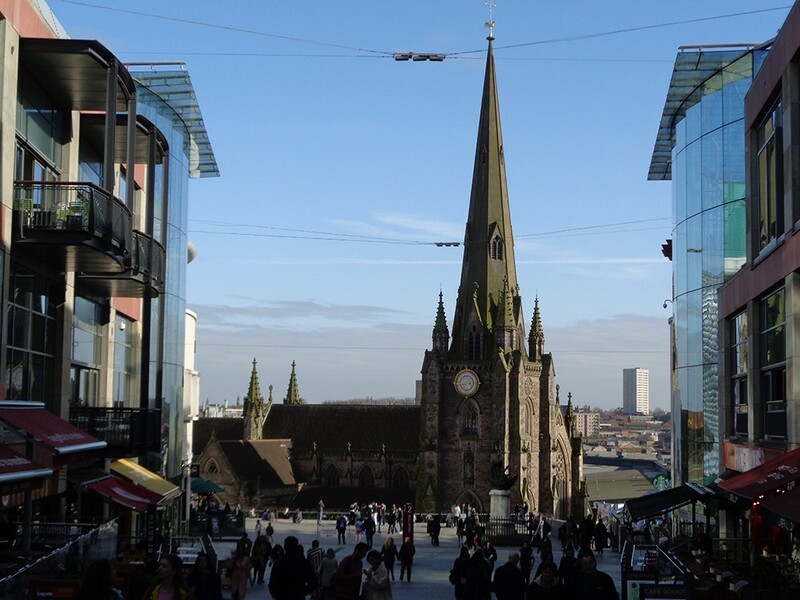 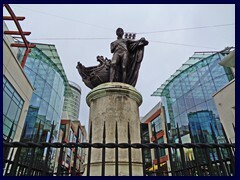 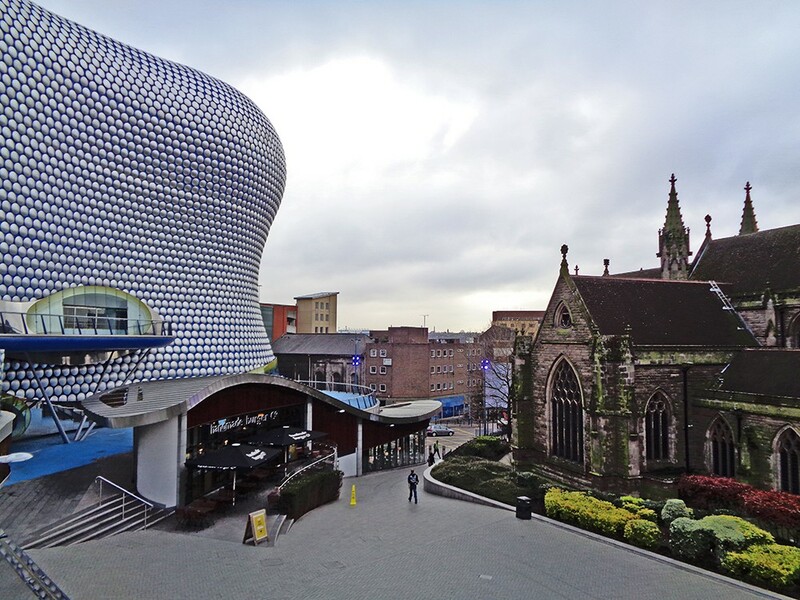 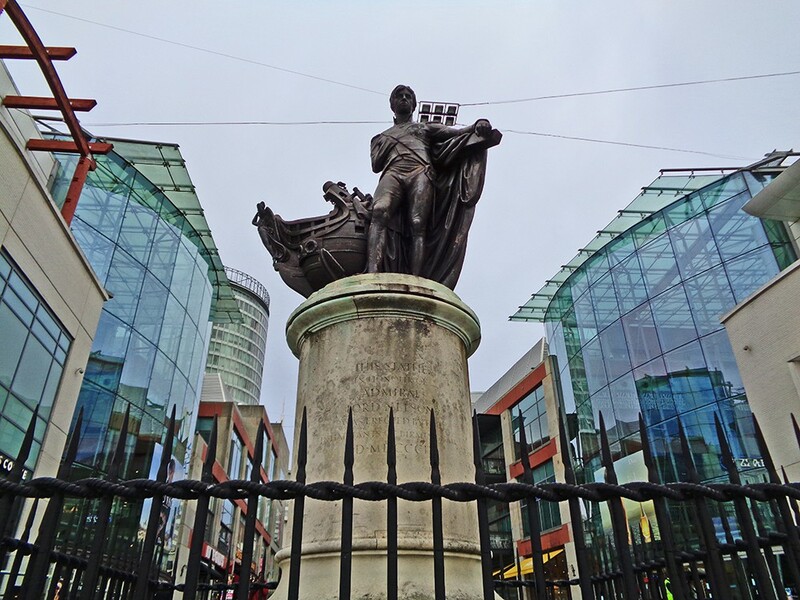 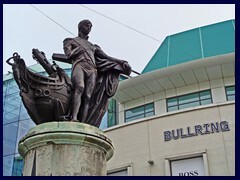 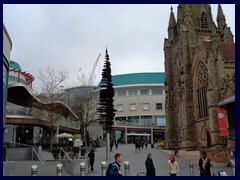 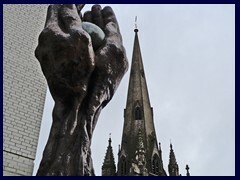 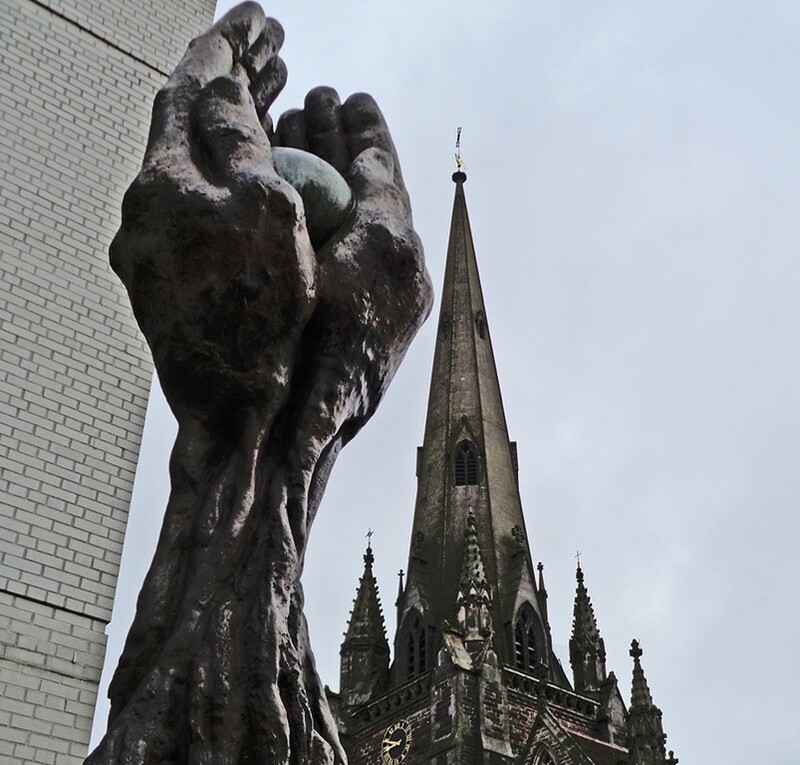 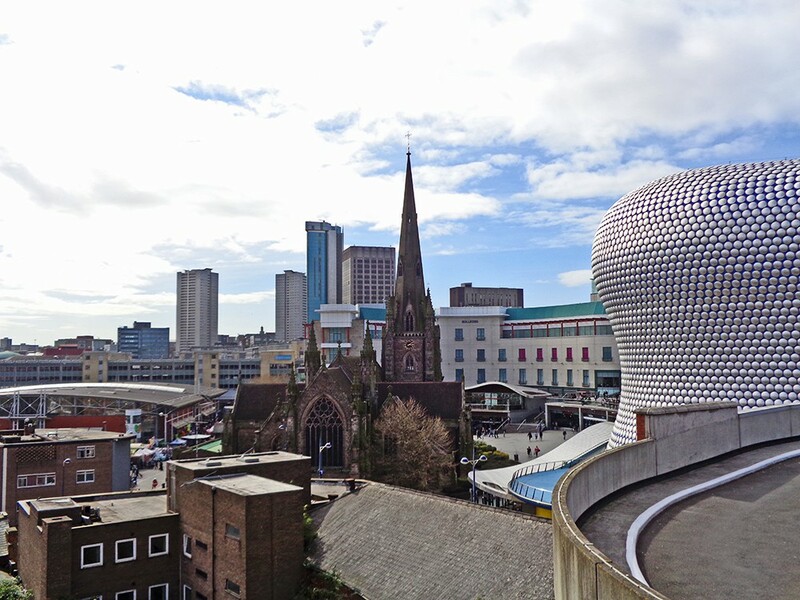 In front of the church is St Martins Square, facing a circular modern building.The Bullring Bull, the Statue of Lord Nelson and the Tree of Life memorial with its two hands and insciptions are significant sculptures in the Bull Ring complex. 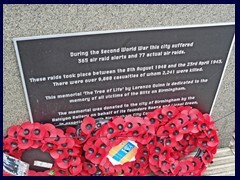 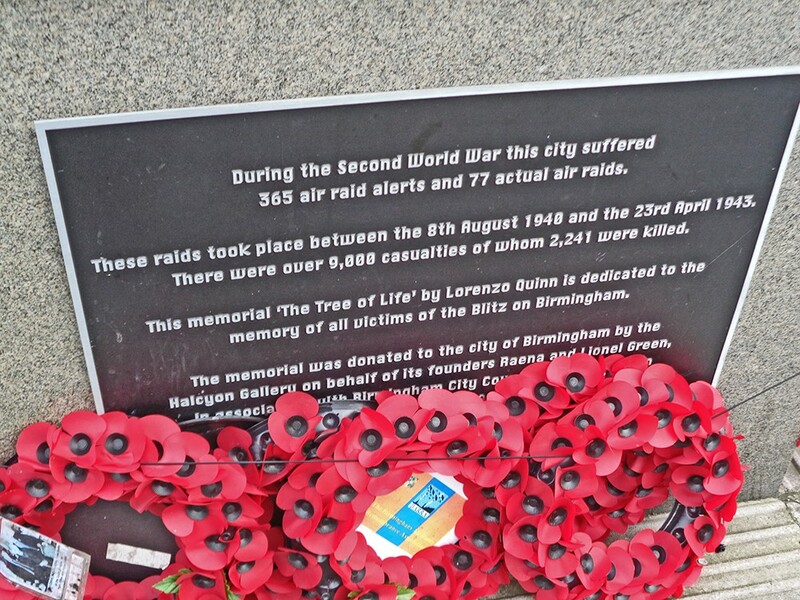 The Tree of Life is a World War II is a memorial to the deaths from the 77 air raids and 365 air raids between 1940 and 1943. 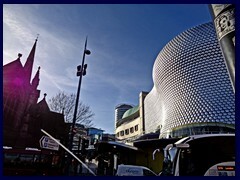 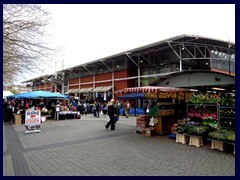 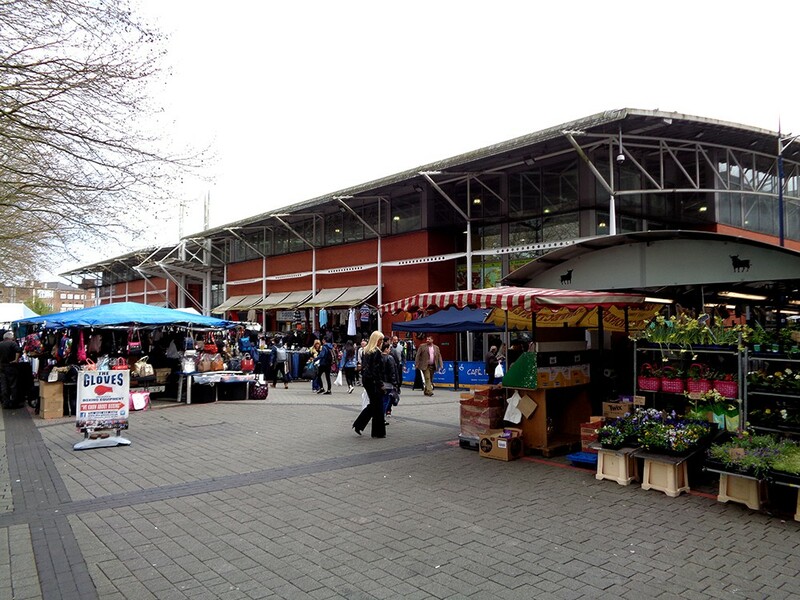 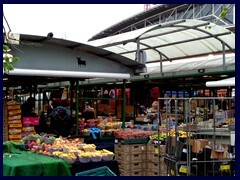 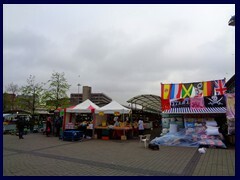 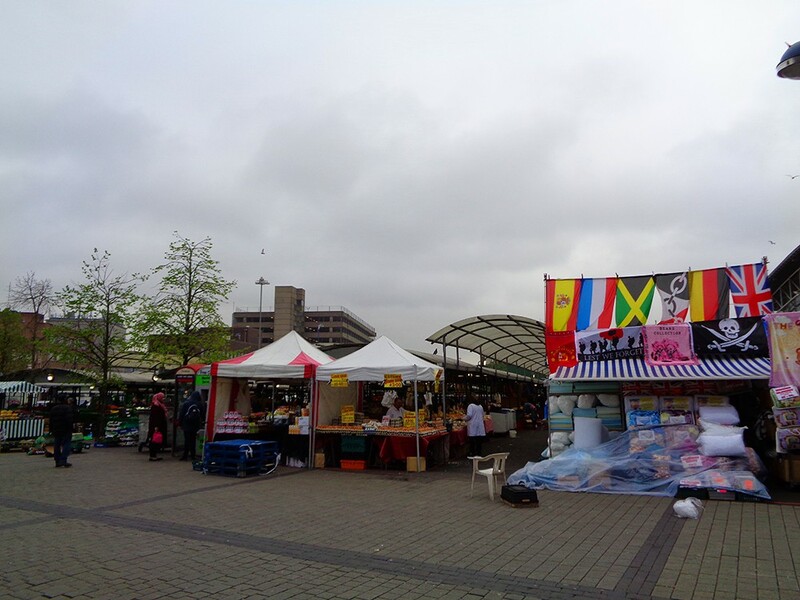 Bullring Market is an outdoor market where you can buy everything, just next to the church. 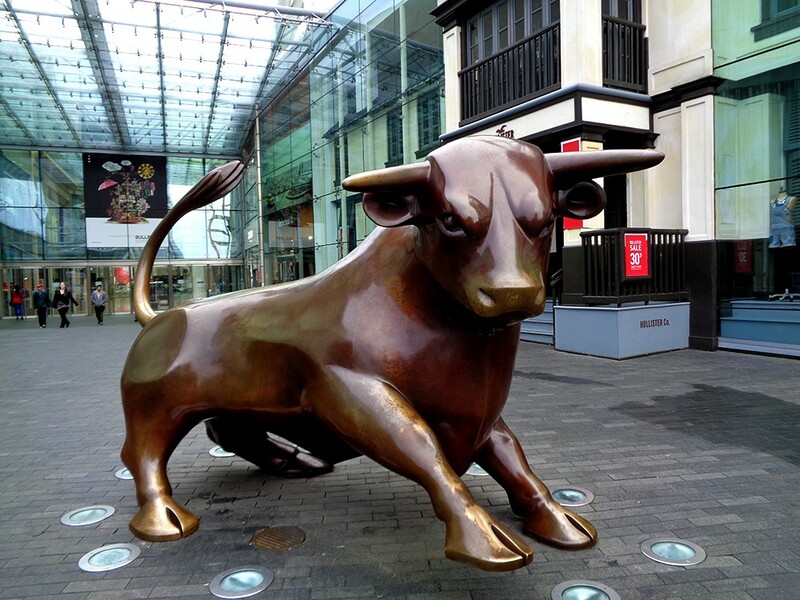 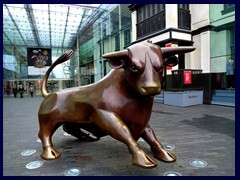 When the redevelopment of the Bull Ring begun in the early 2000s, a ditch from the 12th century and trails of a pottery was found when excavations were made. 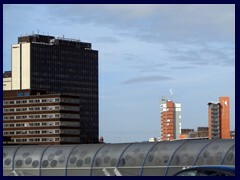 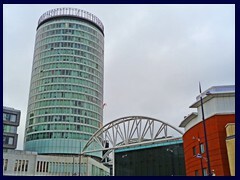 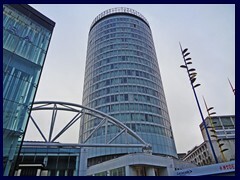 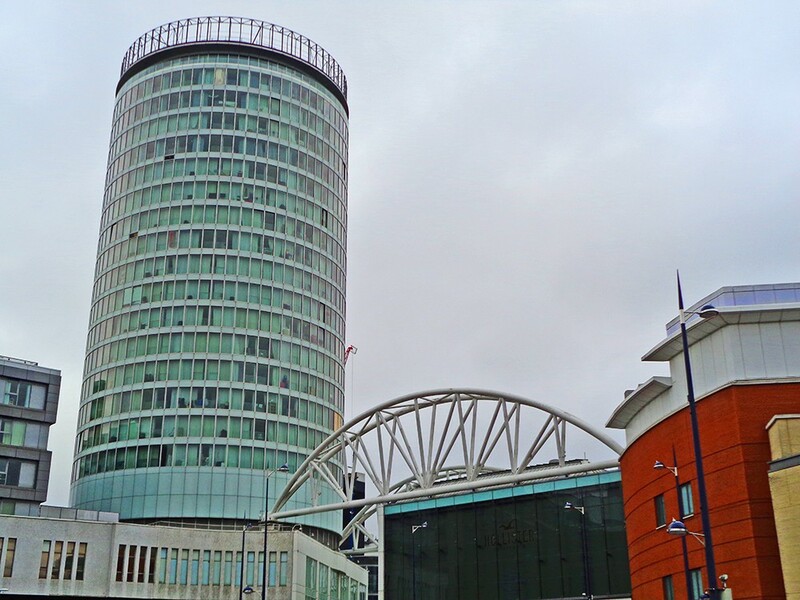 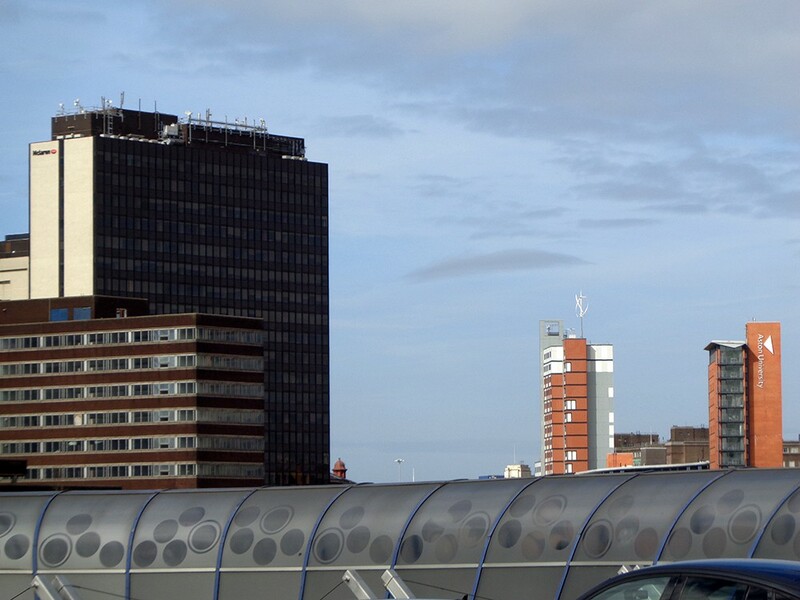 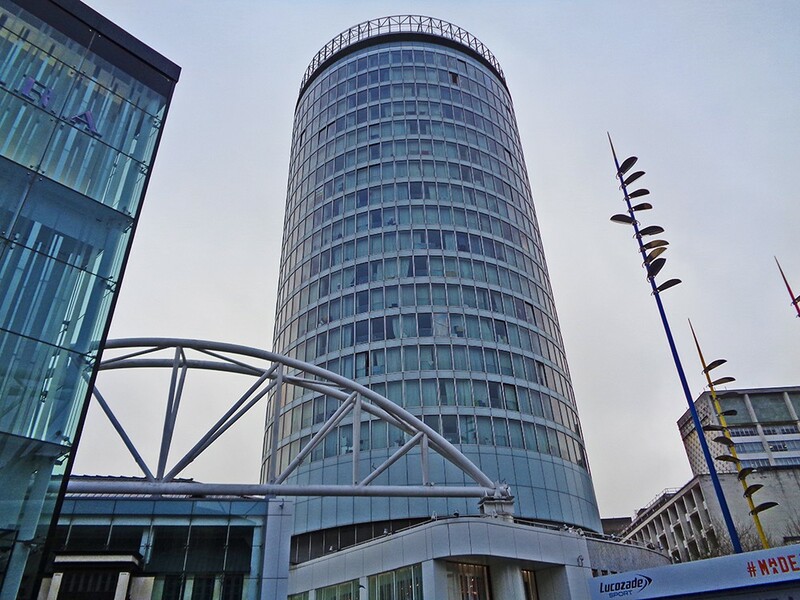 The Rotunda is a 25-storey circular office tower, built in 1965. 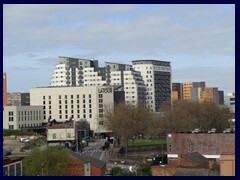 It features apartments and an apart-hotel. 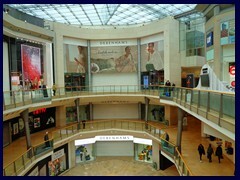 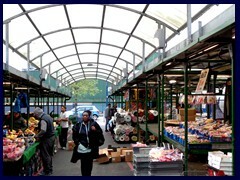 In 2004-2008 all walls were replaced by glazed ones. 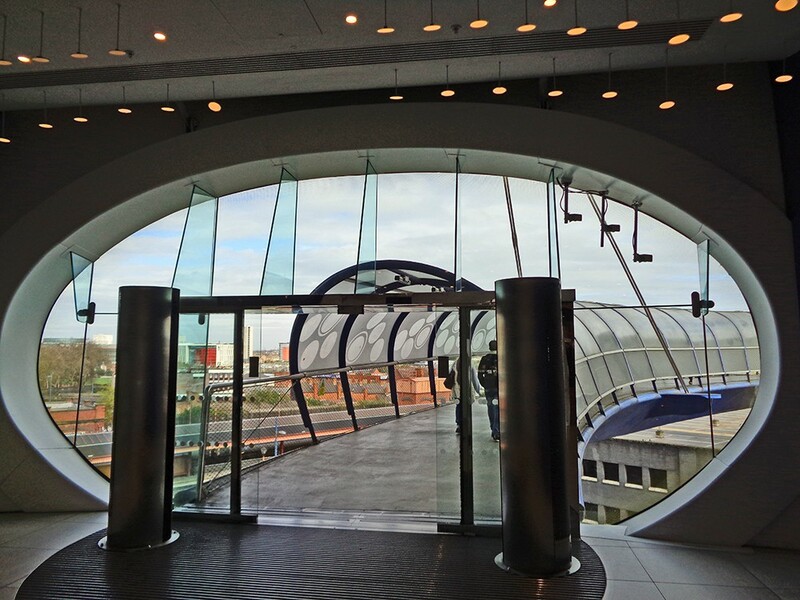 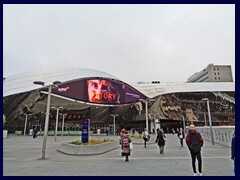 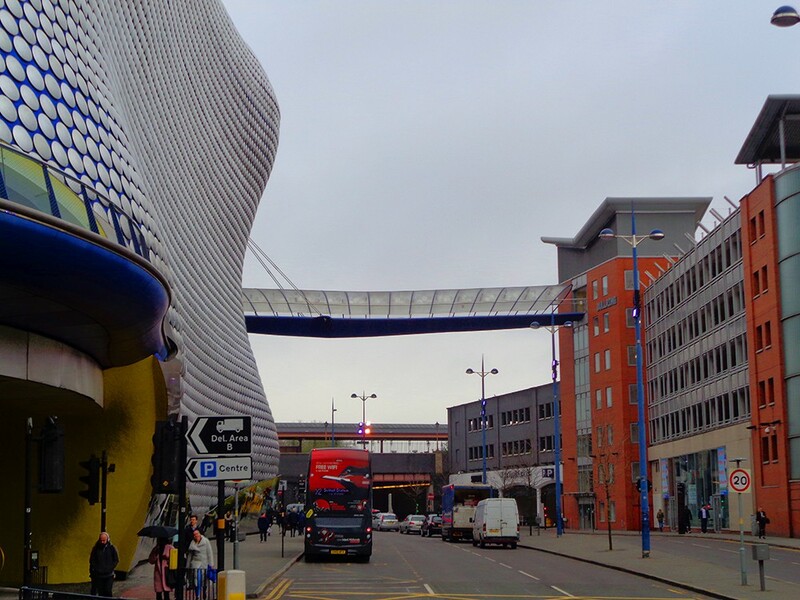 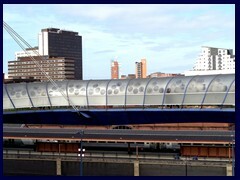 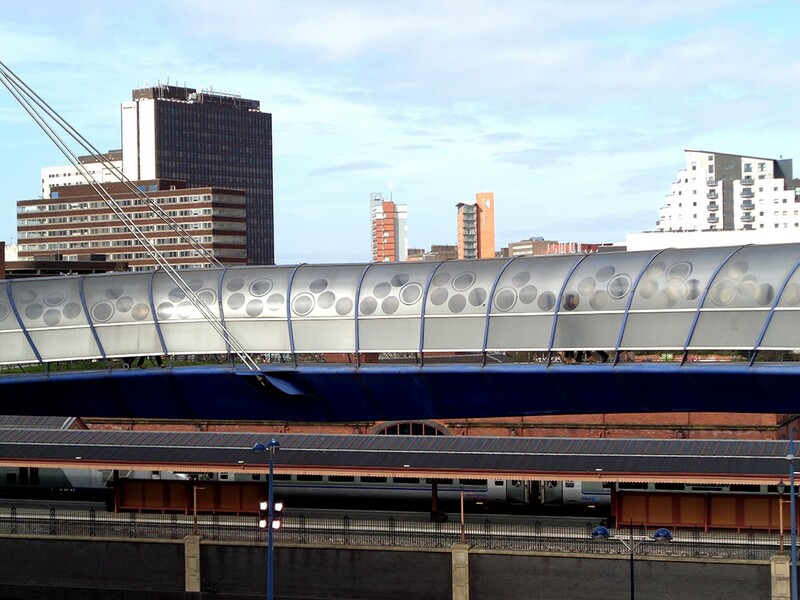 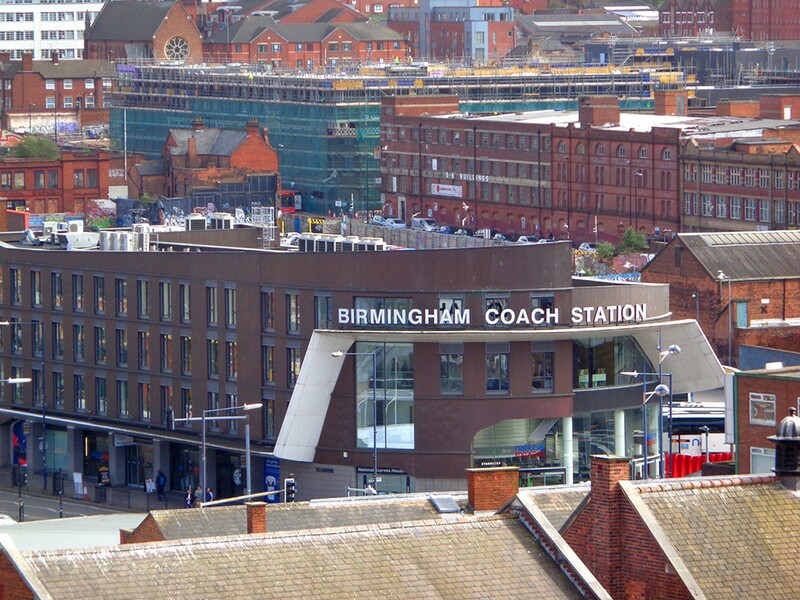 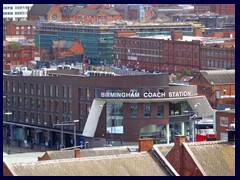 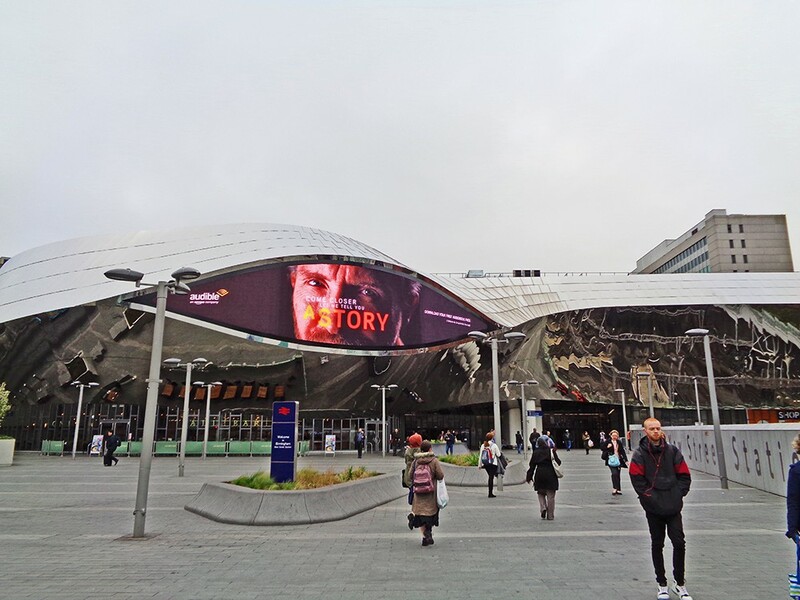 New Street Station, the futuristic main station of Birmingham, is bordering the Bullring.